As we come to the end of another term in Corville NS, we have quite a number of updates for the website. It has been a very successful term for the school so make yourself a cuppa and sit down for a read. This post is going to take a while! Erasmus+ Project: As part of our Erasmus+ project, we are learning all about industry. 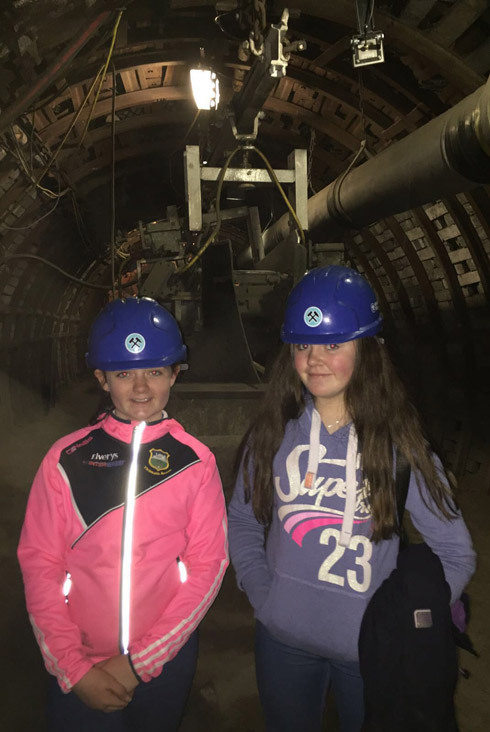 Since September we have been learning about the Coal and Steel industry, both in Ireland and other European countries. After Easter and the beginning of next year we will be focusing on Wool. We are linked with 4 schools in Poland, Turkey, Portugal and Bulgaria. We will have visitors coming from each of the schools over the next three years and some teachers and students from Corville will be visiting them too! Carnival Ball: to celebrate taking part in such an amazing project Corville hosted a Carnival Ball in school today. 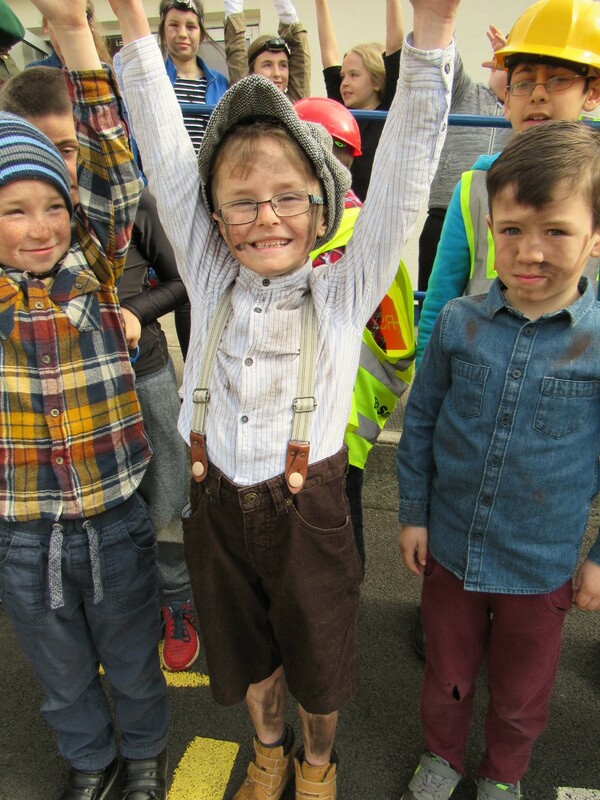 For this Ball, we invited all the children to dress up as industry workers. The industry costume could come from any of the industries we have or will be learning about. The school was very colourful this morning as a result! 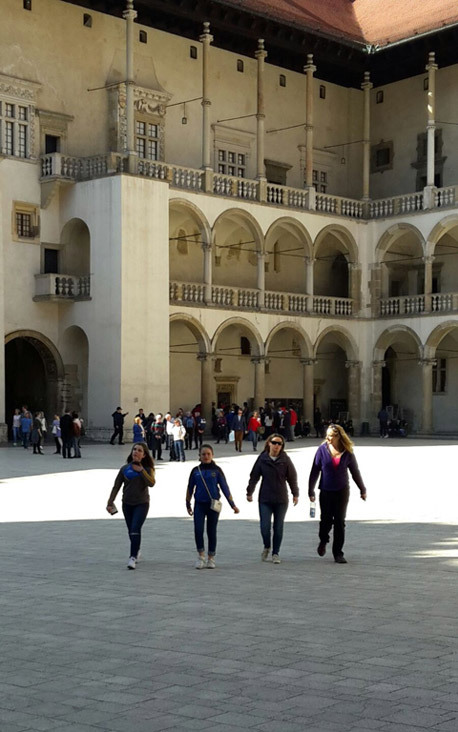 Poland Trip: Ms. Atkinson, Ms. Scott as well as two students Shauna and Leah made a trip to Poland last week as part of the Erasmus+ project. They had a great time in Poland, where they mixed with many teachers and students of different nationalities. 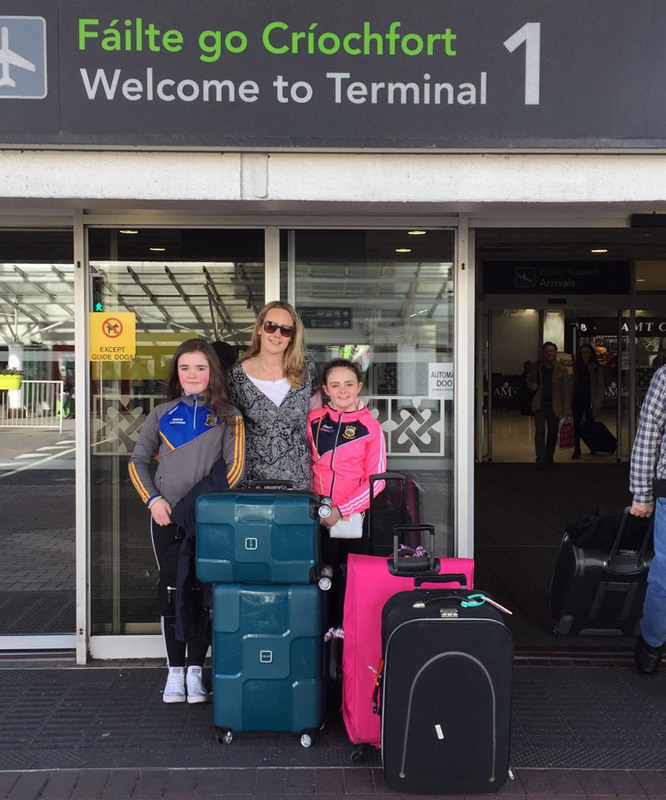 They visited many famous Polish landmarks and had plenty of great memories to bring home to Ireland with them. 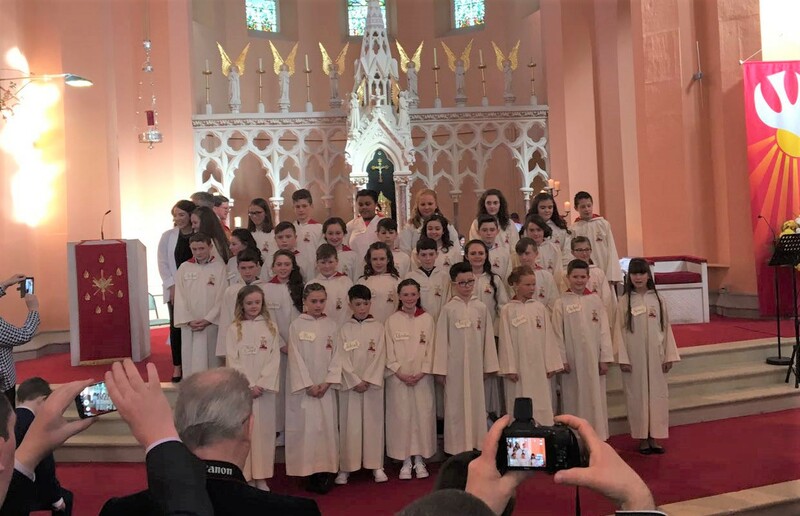 Corville School Choir: The ‘Class Act Choir’ of Corville School recently entered the Walton’s ‘Music for Schools’ competition 2017 with their version of the song Imagine. We are delighted to announce that although we were not selected for the final six, the first round adjudicators singled out our entry as “Highly Commended!” Each child was awarded a certificate from Waltons and the school will receive a framed certificate which we will place with pride on our walls. Well done to all involved, it’s a proud moment and a great achievement for Corville! 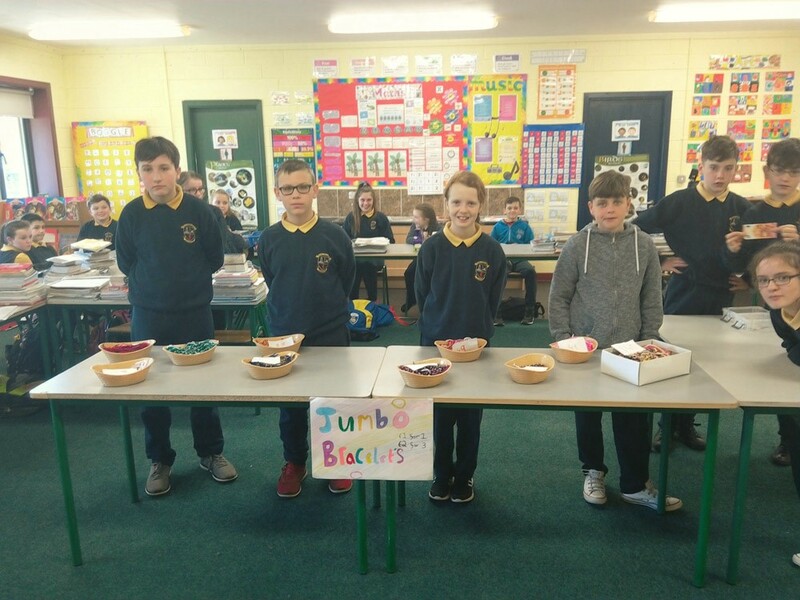 Junior Entrepreneur: Ms. Butler’s 5th class have been engaging in the Junior Entrepreneur program 2016/17. 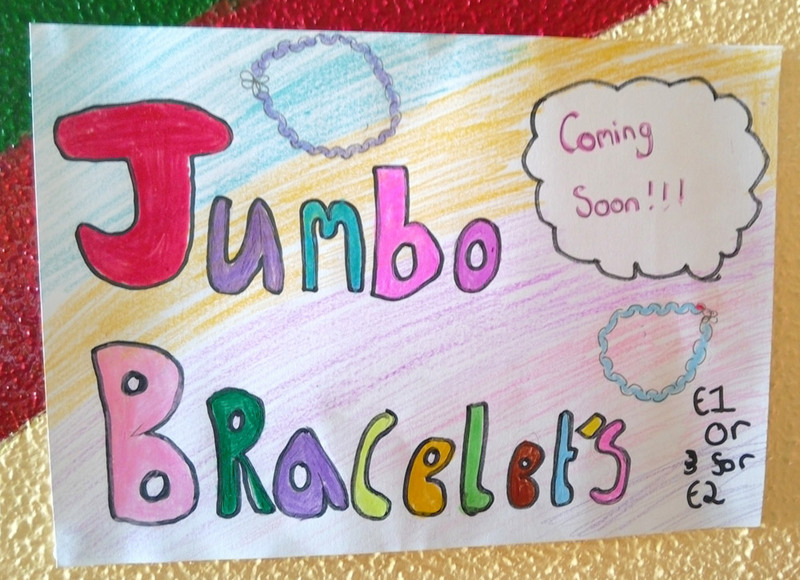 Last week saw the class in workshop mode as they had hundreds of ‘Jumbo Bracelets’ to make. 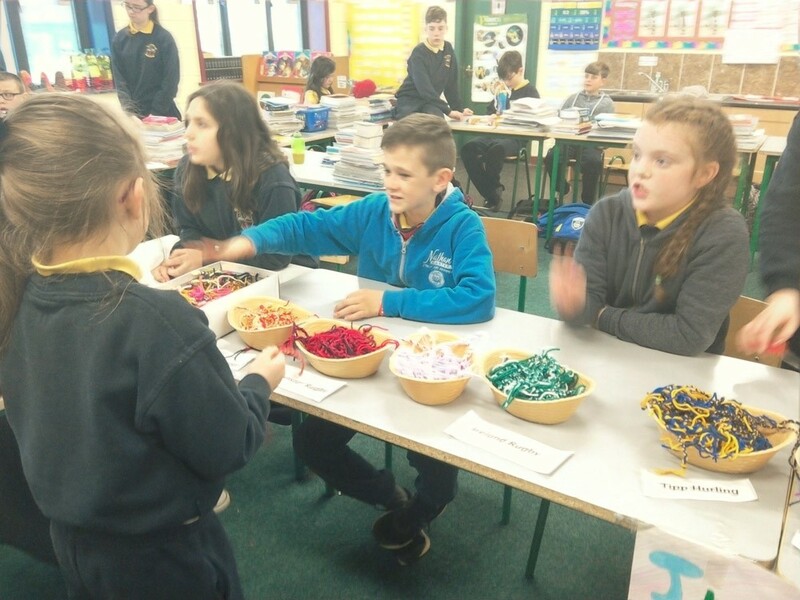 These bracelets went on sale on Friday and 5th class made a nice profit on the day. There were a range of bracelets to buy in different colours representing the school, Tipperary, Ireland rugby and popular soccer teams. All those involved in the project should be very proud of the effort put in. Hopefully, we will see some of these students go on to be entrepreneurs in later life. German Club: The school has been running a free German language club throughout the 2nd term. 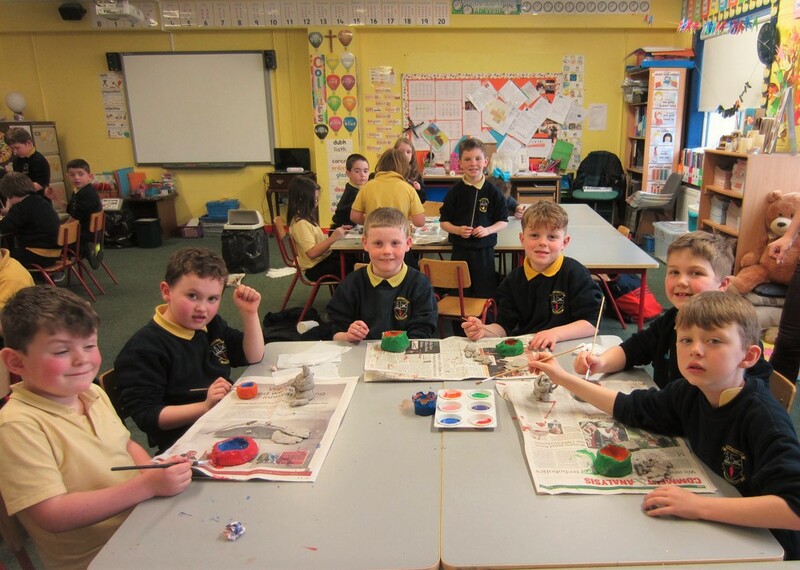 Ms. Ryan has been working with 6th class students and 5th class students. They have been introduced to the German language and covered topics such as greetings, food, counting, holidays etc. This will give all those involved a nice head start when they go to secondary school next year. National Spring Clean 2017: as part of our on-going green flag endeavours, the school participated in the National Spring Clean 2017. 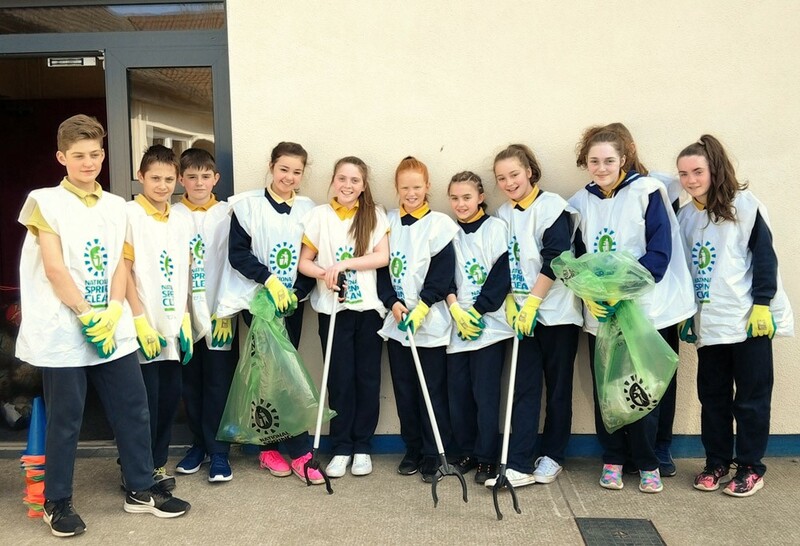 Our 6th class students are pictured taking part in a litter pick on the school grounds. It is great to have the school looking so clean! 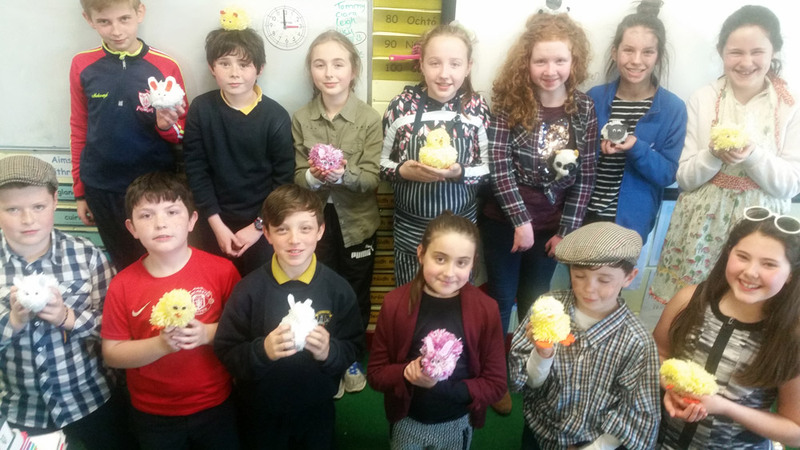 Fabulous Art Work: Ms. Mulderrig’s 5th class have spent the last two weeks working on creating farm yard animals out of wool. I think you will all agree that they did a great job. 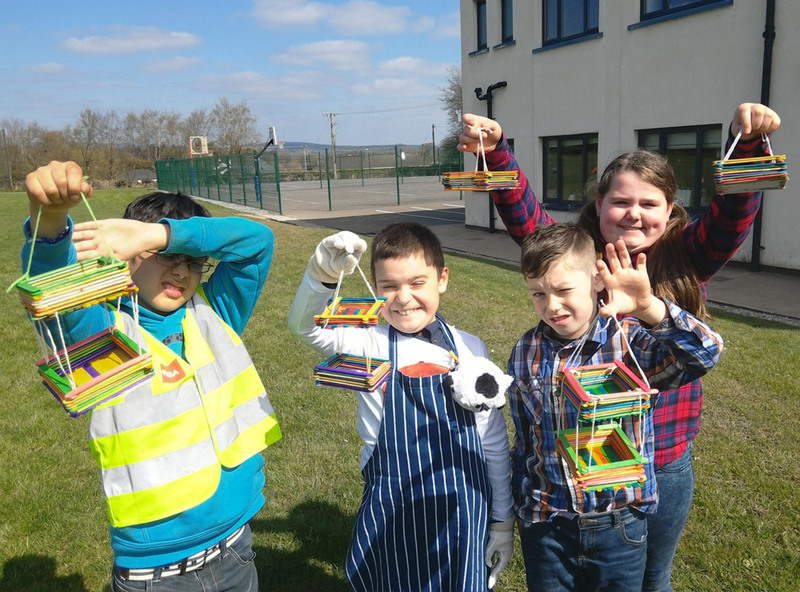 Bird Houses: Ms. Browne’s 3rd class undertook a great class project last week. 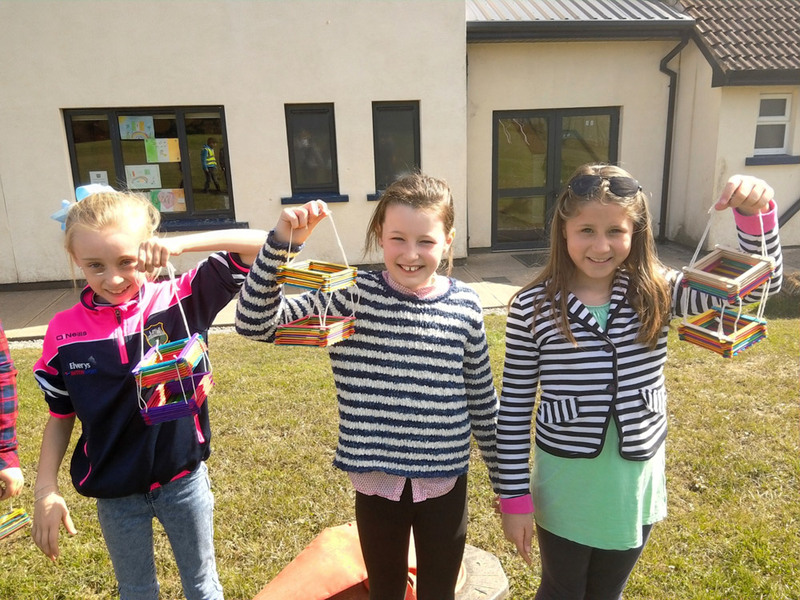 her class spent the week making birdhouses out of lolly pop sticks and then hung them around the school. This all helps with caring for the environment and it will hopefully aid biodiversity in the school. 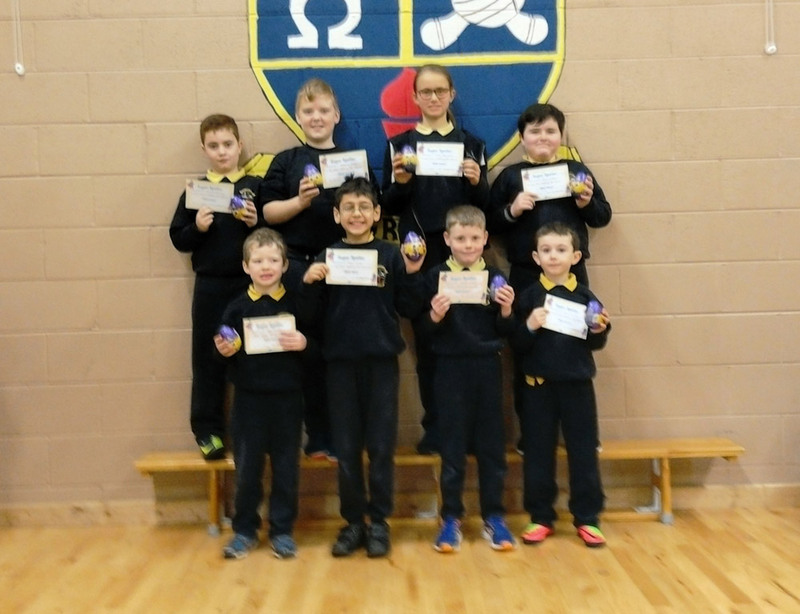 Easter Students of the Week: the winners of our Easter Students of the Week competition each won an Easter egg for their great work and great behaviour in class. 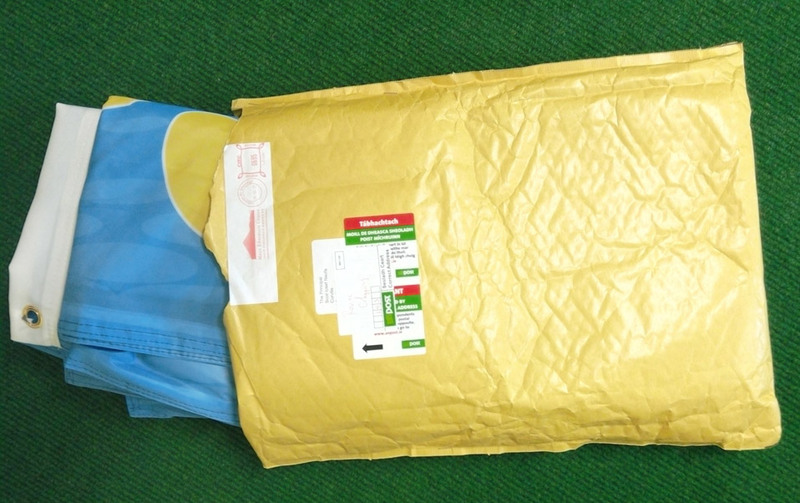 Well I wonder what has come in this package? Could it be an Active Flag? All will be revealed soon. 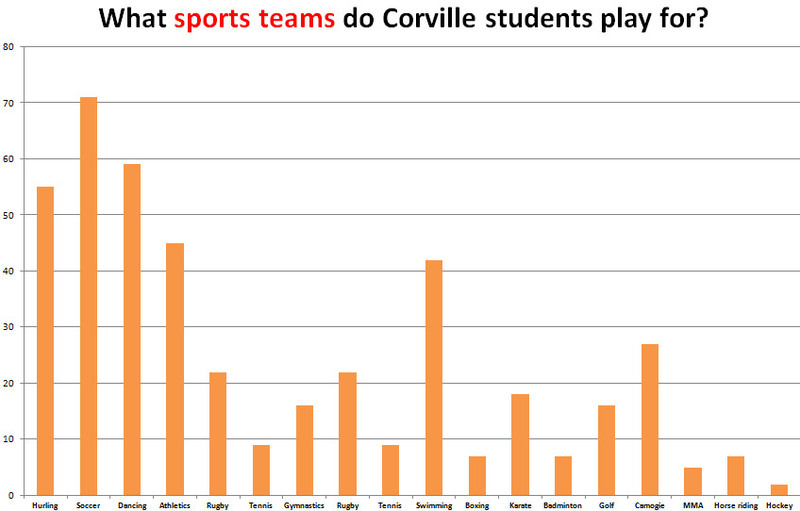 The sporting season to date has been phenomenal for Corville and things just keep getting better this term. 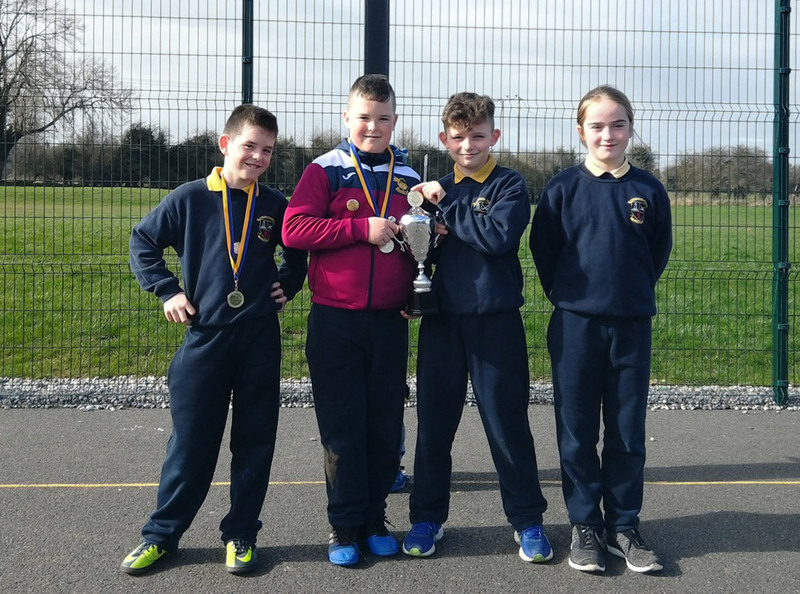 Our camogie girls and soccer boys have had big results this week with both qualifying for the county finals later this year. 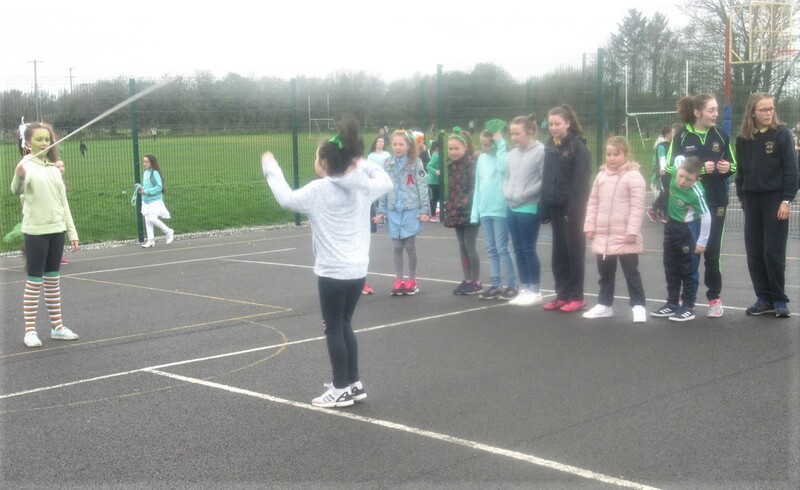 U/13 Girl’s Camogie: Under the watchful eyes of Ms. Darcy and Mr. Stapleton our U/13 girl’s camogie team took part in a blitz on Wednesday. The girls played with a new found confidence which reflects the effort put in by the coaches and the players. These girls are now getting used to winning and they like it. You would be hard pressed to find a more competitive and driven team in Ireland. The girls put in a real team performance on the day and overcame Scoil Eoin, Lissenhall and Moneygall to win their blitz and progress to the final. Best of luck in the final girls! Boys Soccer: it was the boy’s turn to get a run out at Two Mile Borris fo the North Tipp round of the FAI Spar 5 a-side soccer tournament. The boys have been training for many months now in preparation for this tournament and we made the short trip to Two Mile Borris with high expectations. Corville brought an A and B squad to the game. Each team was placed into a league with 4 other teams from North Tipp, with the 2 Corville teams being kept apart. The winners of each league would progress on to represent North Tipp in the County Finals. The A team consisted of Aaron, Cian, Devin, Ryan T, Brian, Graham, Daniel and Kyle. Each member of the squad played their part in helping to secure a table topping performance with 4 wins out of 4. When the going got tough our boys certainly got going. Real quality and determination was shown throughout. The A squad now go on to the county finals at the end of the month in the same venue. 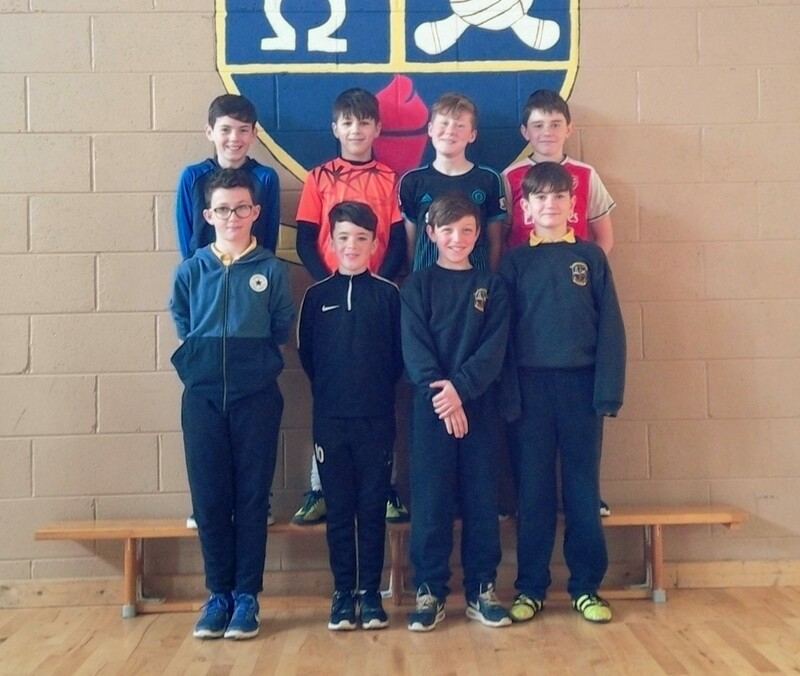 The B team consisted of Adam, Seán, Leigh, Alex, Ryan, Leon, Patrick and Michael. This team surpassed all expectations and came very close to winning their division too. They won their first 3 matches and only had to secure a draw at the very least in the final match to progress to the county finals. Unfortunately, the boys were beaten in the final match by a strong Carrig A team. This was a heroic effort by our B team boys and it points to a bright future for the school in this competition. The coaching team of Mr. Scully and Mr. Darcy were delighted with the effort and never say die attitude of the Corville teams. They were very well behaved and acted like champions at all times. As always, they were a credit to the school and we wish the Boys A team squad and our Girls A team squad all the best in the county finals at the end of the month! 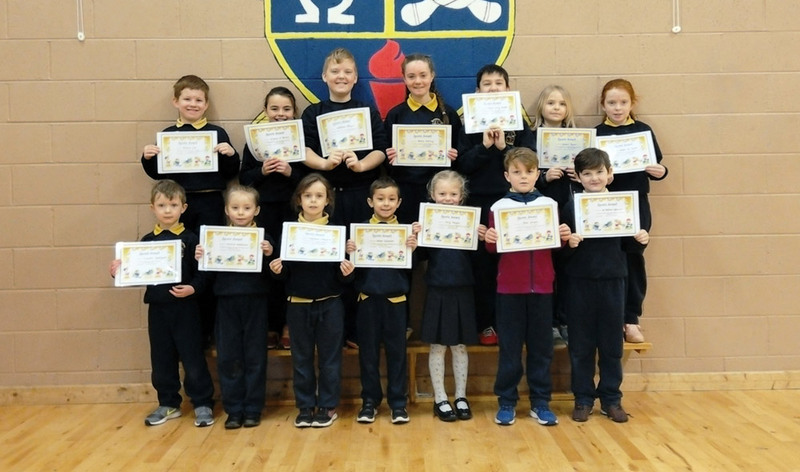 Active Students of the Month: March was our month of skipping. 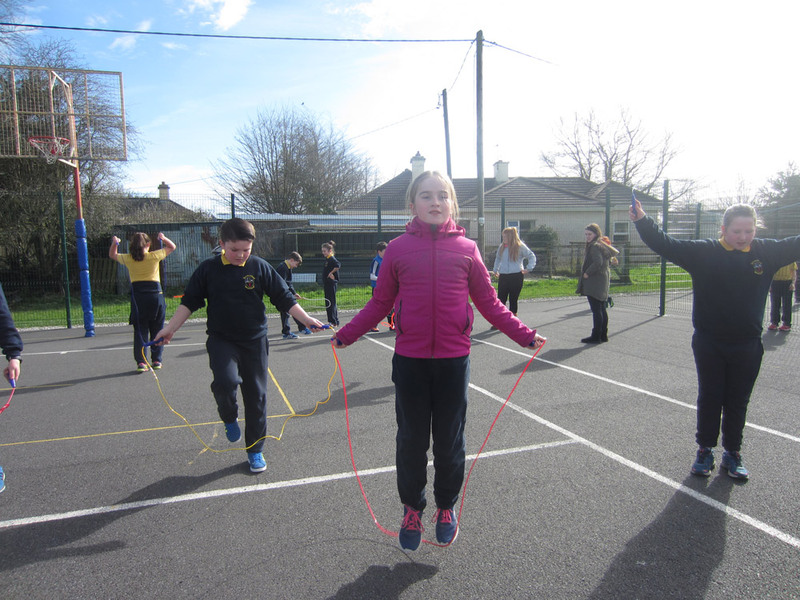 It was a highly enjoyable month for all the students and many skipping skills were learned. Each class teacher picked a student from their class that they felt deserved an Active Award for their efforts throughout the month. Congrats to all our winners. 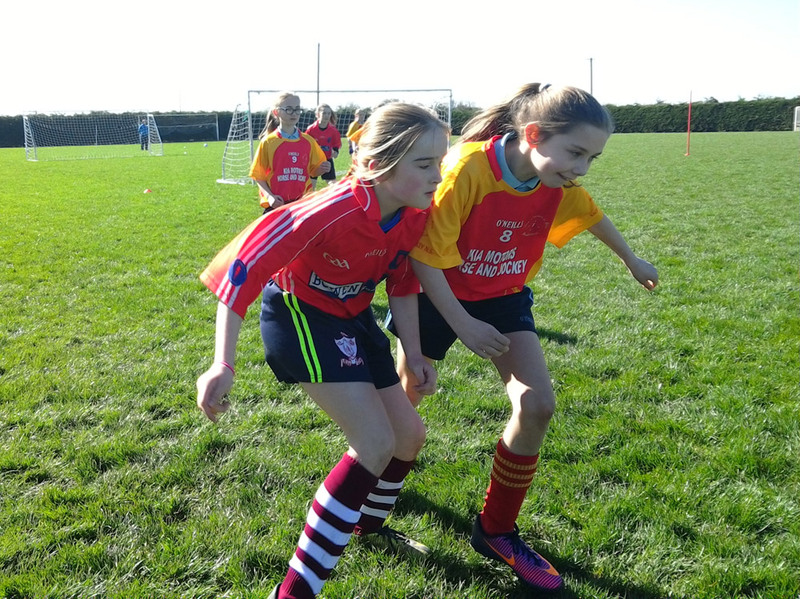 Tag Rugby Blitz: our school recently took part in a local rugby blitz held on the Roscrea rugby club grounds. 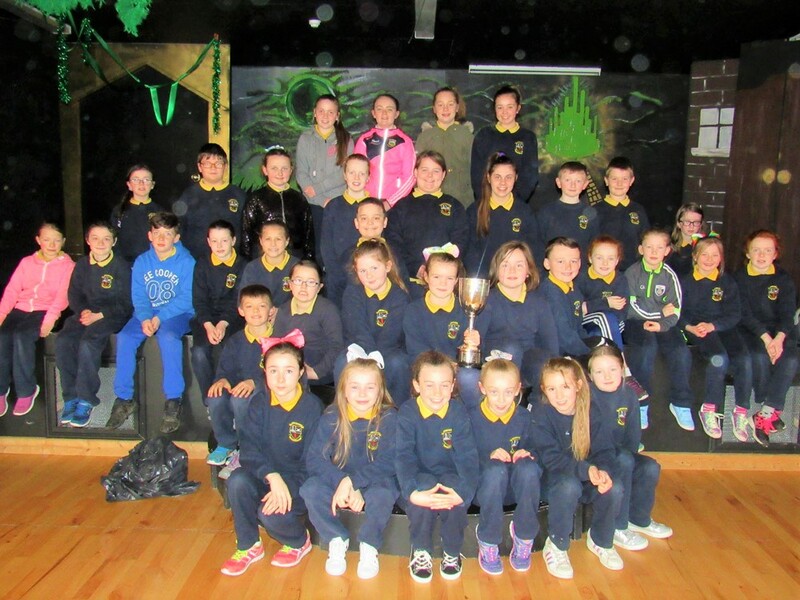 The team consisted of boys and girls from 6th and 5th class. They got a chance to put into practice all the rugby skills they have learned over the last few months. It took the Corville team a little while to get into their stride but once they did they played some fantastic rugby in what were poor weather conditions for throwing the ball about. The coach, Ms. Butler, was very proud of the effort put in by everyone. 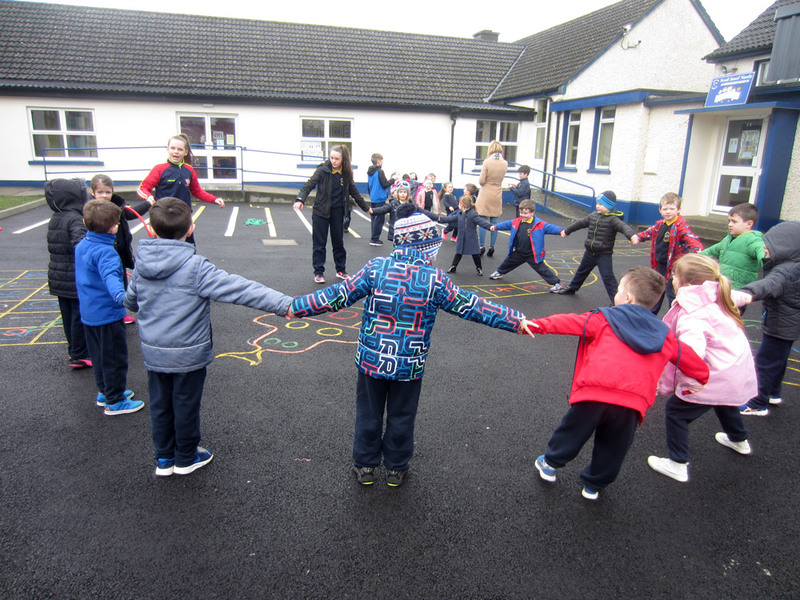 School Céilí: we had a very enjoyable day in school on Monday as all our classes took part in a school wide Céilí. Each class got a chance to show off the dance moves they had learned over the previous few weeks (during our Active School dancing focused month). One by one, each class performed in front of their peers. It was great to see boys and girls dancing with skill and confidence throughout the day. 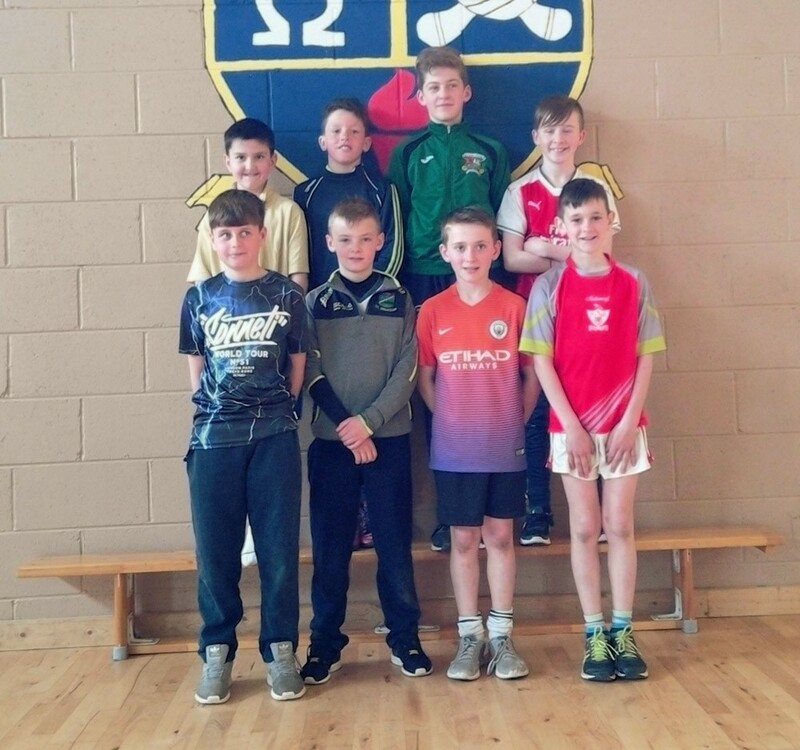 Hurling Training: the boys continue to train hard every Tuesday and Thursday after school. We are delighted with the efforts being put in by all the boys. All boys from 3rd to 6th are more than welcome to come out and join us. The big hurling blitzes get under way when we get back from our Easter holidays. Former Tipperary senior hurling player Mr. Stapleton has been a great addition to the coaching team and we are sure our boys will be chomping at the bit when it comes to competition time. Easter Holidays: Well, that is everything that has been going on in the school in the school recently. We hope you enjoy the Easter holidays. Recharge the batteries and come back refreshed for what will be a jam packed term 3 in school. See you all again on the 24th! Confirmation: Congratulations to all our 6th class boys and girls who made their Confirmation on Saturday, March 25th. It was a lovely sunny day and that added to the great day everyone had. Our students and Ms. Madden put in a lot of preparatory work throughout the school year to prepare for this big day. So it was nice to see everyone behaving themselves so well; you were a credit to the school. Thanks also to Ms. Browne, Ms. Sheehy and the school choir for the lovely singing during the Confirmation ceremony. 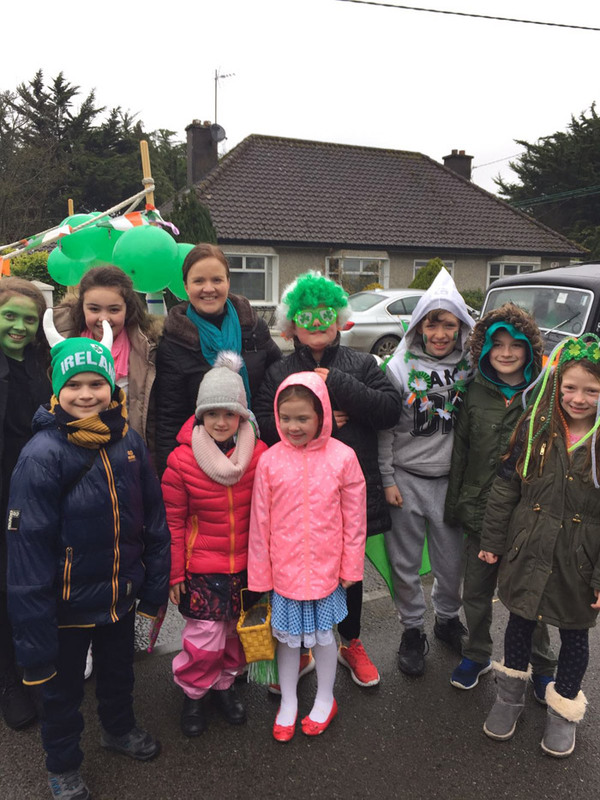 St. Patrick’s Day Parade: we had a fine turn-out from the school at the Roscrea parade. We performed some of the songs from our Christmas play – Wicked. The conditions weren’t great but we didn’t let that dampen our spirits. We were awarded for our efforts with a winning trophy from the parade. 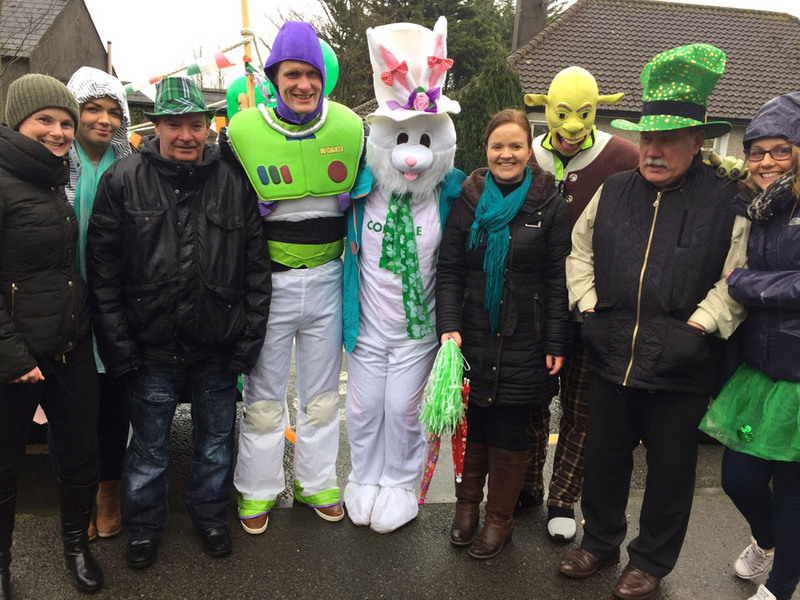 Well done to all the teachers and students that gave up their time to dress up and march in the parade. Erasmus: Corville are very lucky to be taking part in the Erasmus+ project this year. 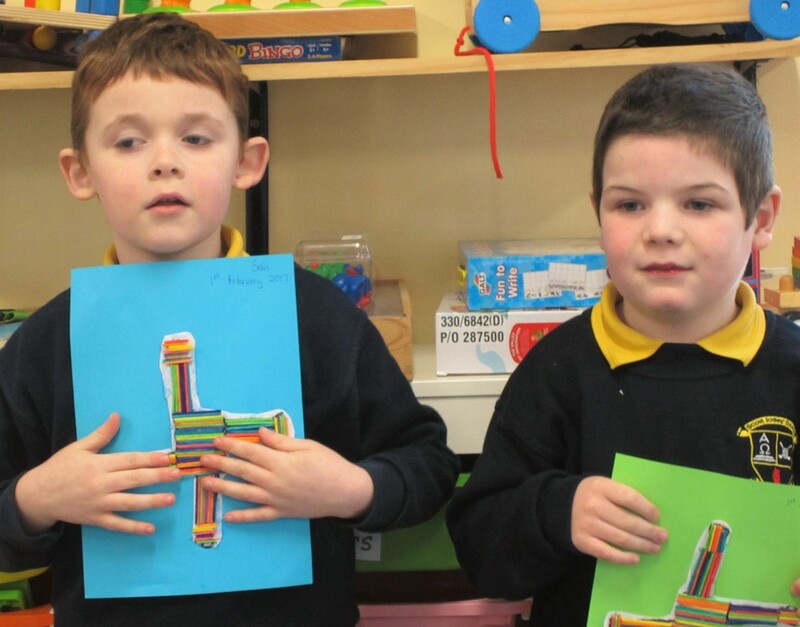 We are the coordinating school in Ireland and are linked with four other schools around Europe. As part of the programme we will be travelling to each of the four countries; Poland, Turkey, Bulgaria and Portugal. 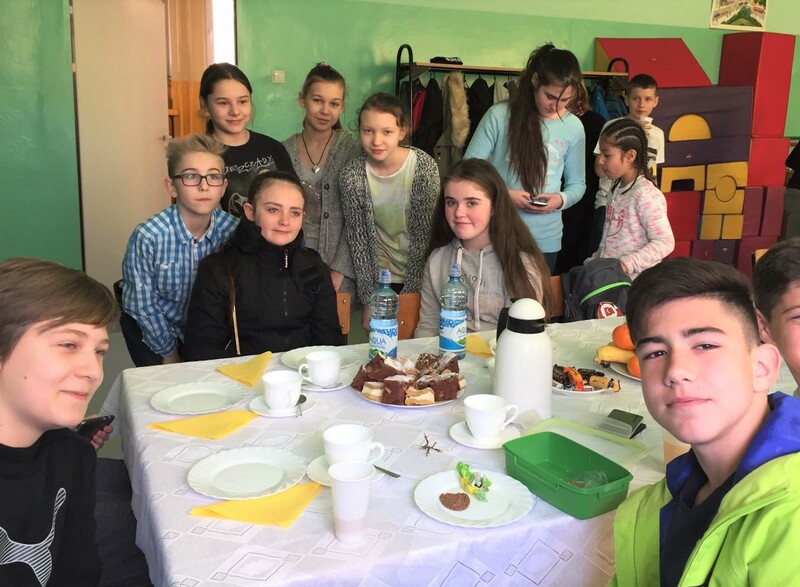 So far we have visited a school in Bulgaria. 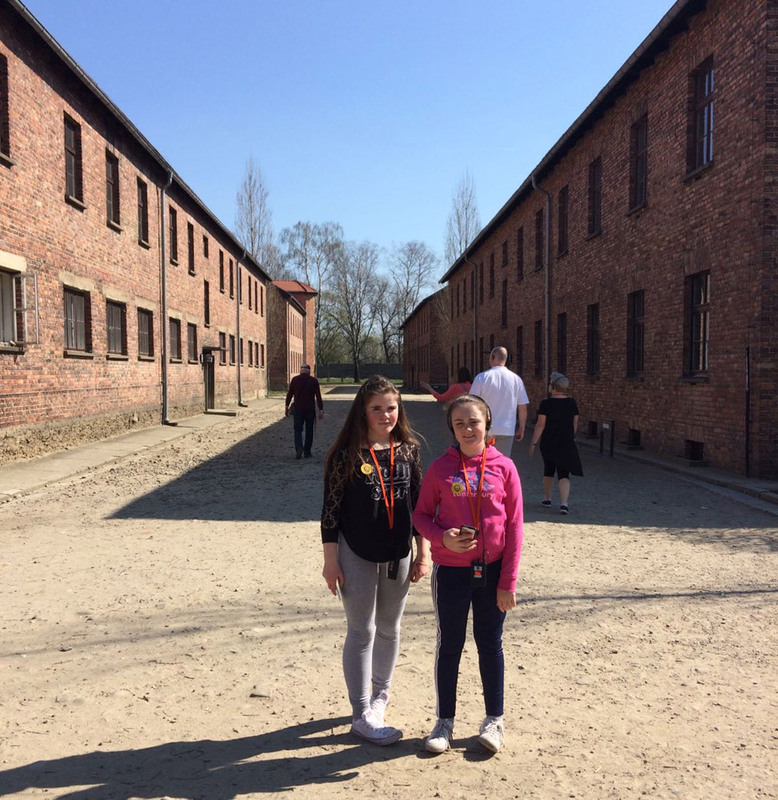 This week Ms. Atkinson and Ms. Scott are travelling with two students, Leah and Shauna, over to a school in Poland. They will stay there for one week and will be meeting with the students and teachers of a Polish school. I am sure they will have a great time and it will be a lovely experience for all four of them. 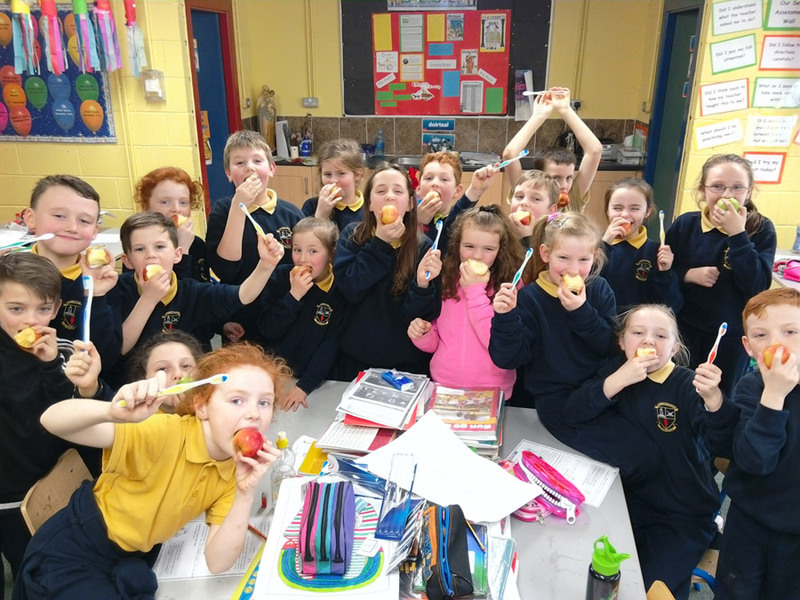 Junior Entrepreneur: Ms. Butler’s 5th class are taking part in this initiative. They are busy making bracelets for sale in school. They have hundreds to make so you can imagine how much time and effort all the kids are putting in. The bracelets are going to be on sale on later this week. We wish all the 5th class students all the best with this project. Active Flag Update: our activity for this month is skipping and I have never seen a school so enthusiastic to get their skipping ropes out. At the start, barely anyone was able to skip. It certainly seemed like skipping was a forgotten art in the school yard, but after just a few weeks everyone is now flying it. Two foot, one foot, cross-overs, tricks, big rope, skipping rhymes – you name it, we can do it! Active Flag Visit: after 12 months of preparation our school invited an ASF inspector down to check out what we had gotten up to. Fingers were double crossed in the hope that we had done enough to warrant earning a Blue Active Flag. 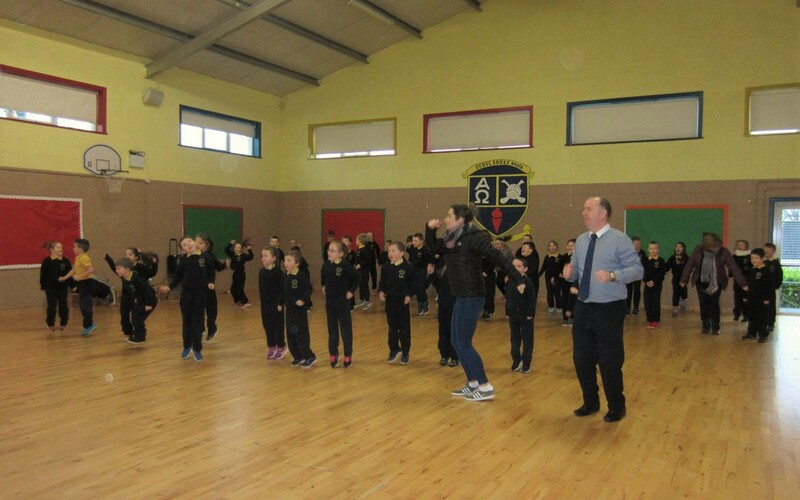 Ms. O’Connell, Mr. Scully and the Active Student Committee took the inspector on a tour of the school where he observed students skipping, playing GoNoodle, discussing fitness projects and surveys, taking fitness breaks, playing yard games and finishing off with their Active Línes. The day went great and we are hopeful that we have fulfilled all the criteria necessary to get the flag. If successful, we will be arranging a launch day in school where we will get an Irish sports star down to raise our flag. It will be an exciting day for the students and they thoroughly deserve it after all the effort they put into this over the last year. We couldn’t have got this far without the help of our principal, teachers, students, external coaches and parents. Thanks for all your contributions. You are helping to make our school a truly special place to part of. 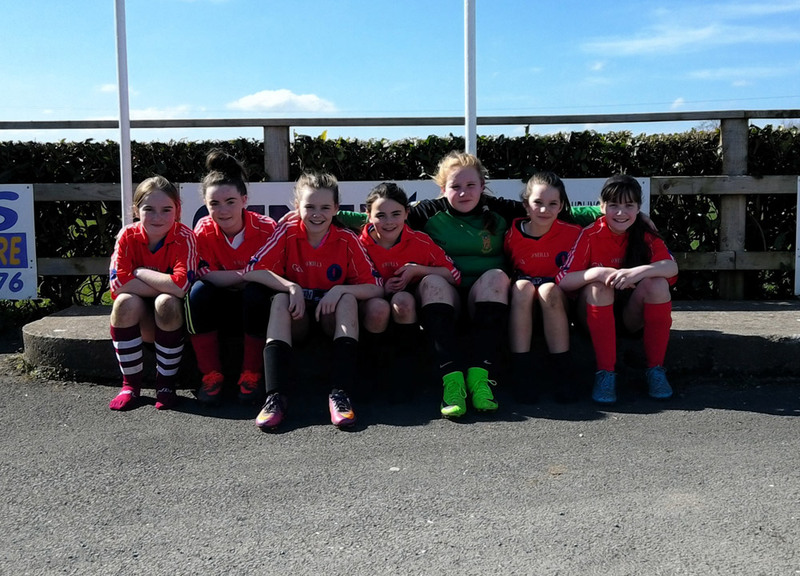 FAI 5 a-side Soccer Tournament – Girls: The first round of the FAI Spar soccer tournament took place on Friday and it was our U/13 girls team that were in action first. This is a big tournament for the school and it was one we have been training hard for for quite a while now. Hopes were high that we could repeat last year’s performance and qualify out of North Tipp. Our team consisted of Khya (Captain), Mollie, Orla, Ceola, Lucy, Niamh and Stephanie. 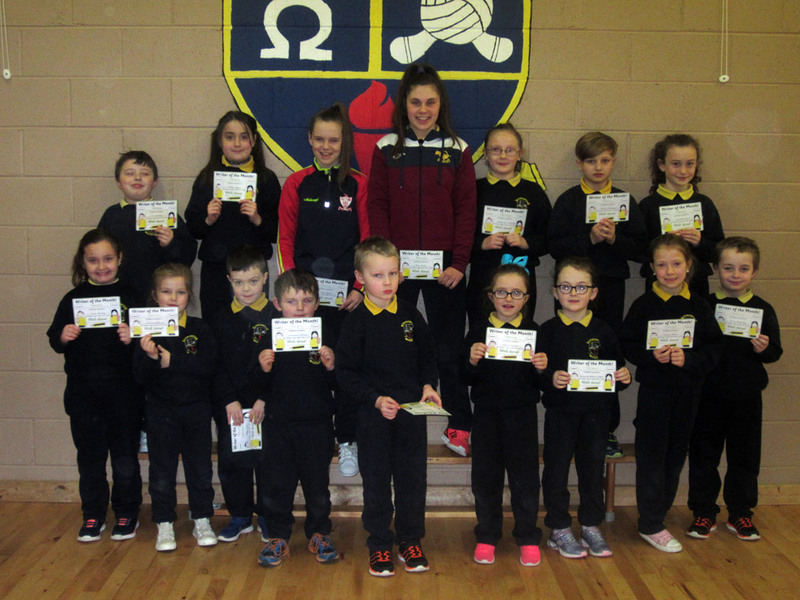 We were drawn into a division with 4 other teams – Scoil Mhuire Thurles, Mullinahone B, Moycarkey and Birdhill B. Our girls won all their matches and improved considerably as the tournament progressed. It was great to see all our outfield players getting on the scoresheet but without Orla pulling off some great saves we might not have progressed through to the next round. Next up: county finals – take place on April 28th in Two Mile Borris. There will be 8 schools returning for the finals. 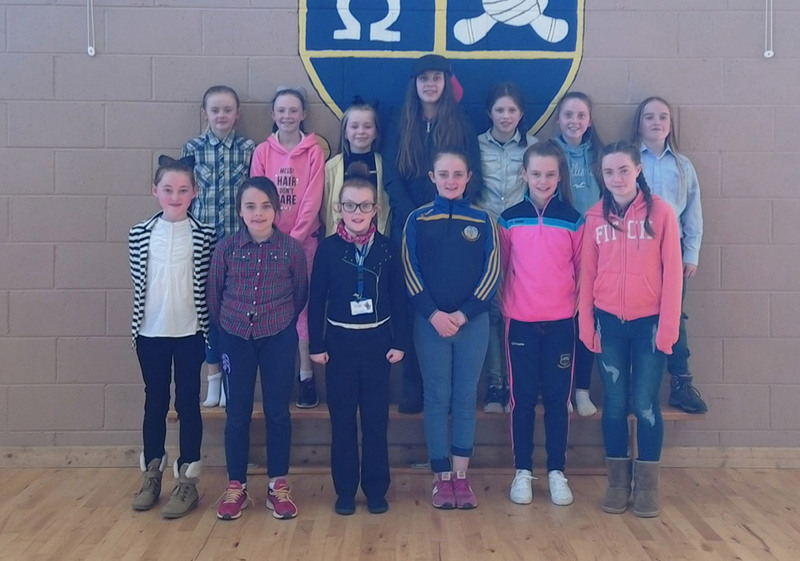 The school that wins will be crowned Tipperary Girls Winners and will go on and represent Tipperary in the Munster finals in Cork on May 10th. Athletics: Our girl’s were also in action at the Sportshall Athletics final up in Athlone last week. We had another great day and managed to win a number of medals. The competition was very tough as our girls had to take on schools from every other county in Ireland. Ms. Browne and Ms. Mulderrig were delighted with the effort put in by the girls. We really do have some superstars in the making here in Corville! 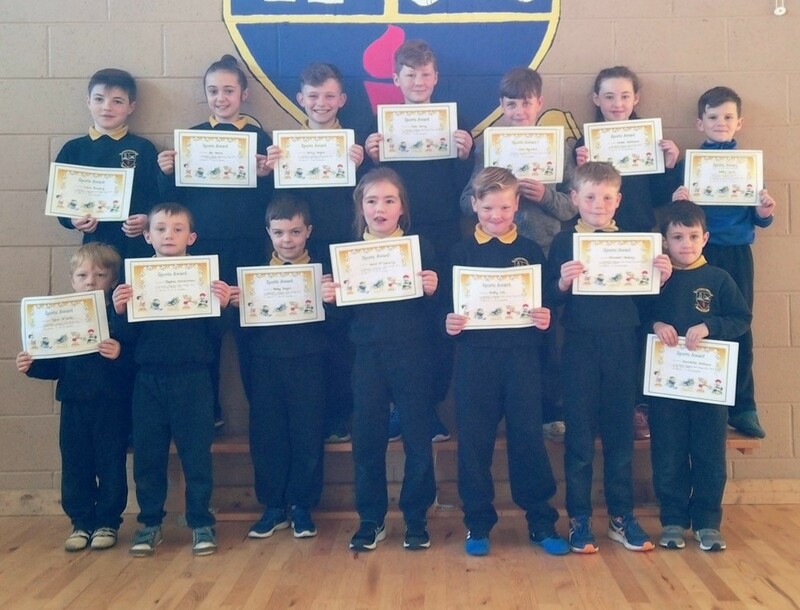 Rugby: congratulations to all the Corville members of the successful Roscrea Community Games U/11s team that became county champions recently. They beat a very strong Cashel team in the Tipperary final, thereby making this a historic day for rugby in Roscrea. It reflects well on the work our school are putting in to tag rugby each week. 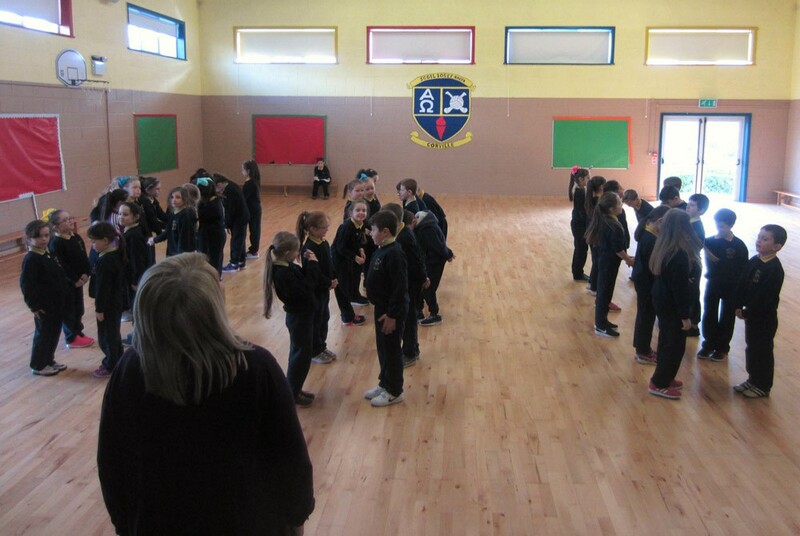 Dancing: our students continue to learn a variety of dances every Monday in the hall. 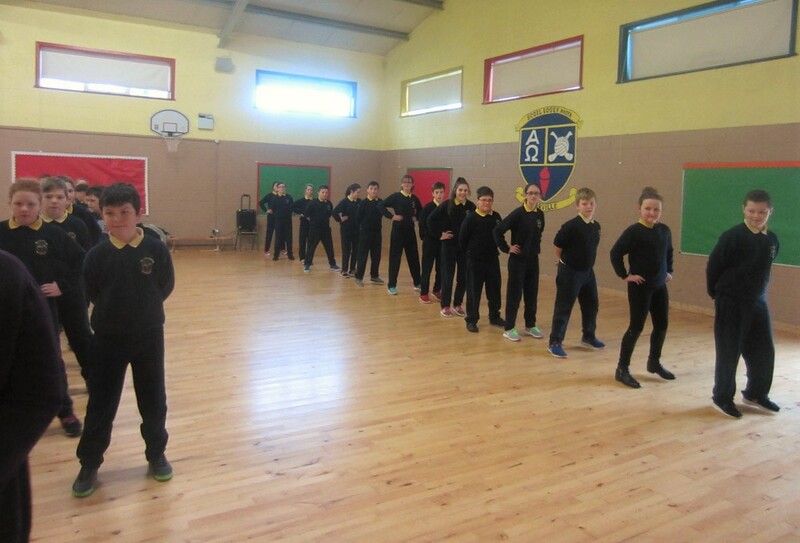 Today they were doing some Irish dancing and learning to march to music. 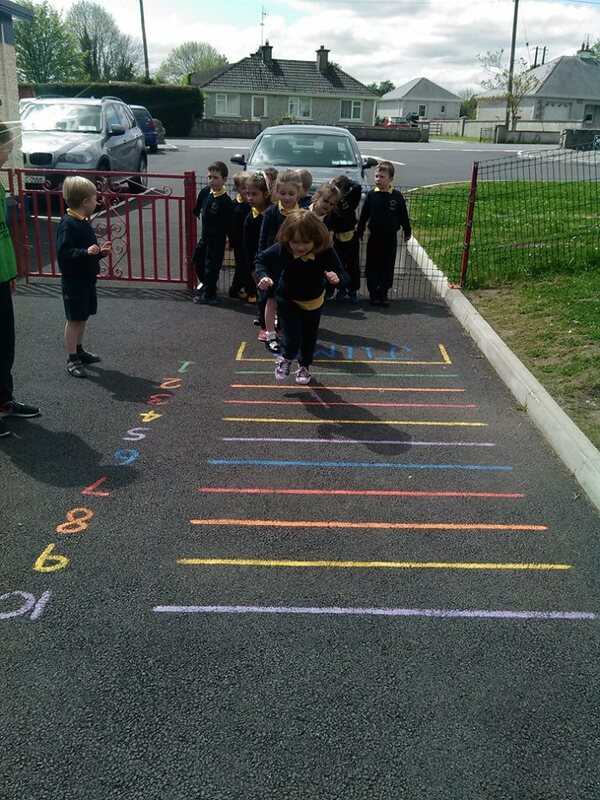 Our Junior Infants are shown below putting their best foot forward. 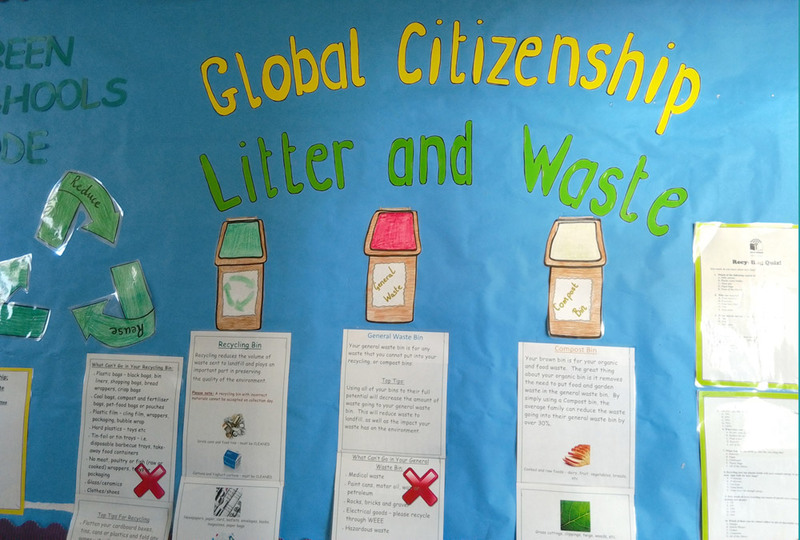 Green School: we are focusing on the topic of global citizenship and ‘Litter and Waste’ as part of our Green flag project. In each classroom we have 3 bins – one for recycling, one for general waste and one for compost. Art projects around the school: we have plenty of fine artists in the school and we love to display their work on the school walls.Below are some excellent charcoal still life pictures. 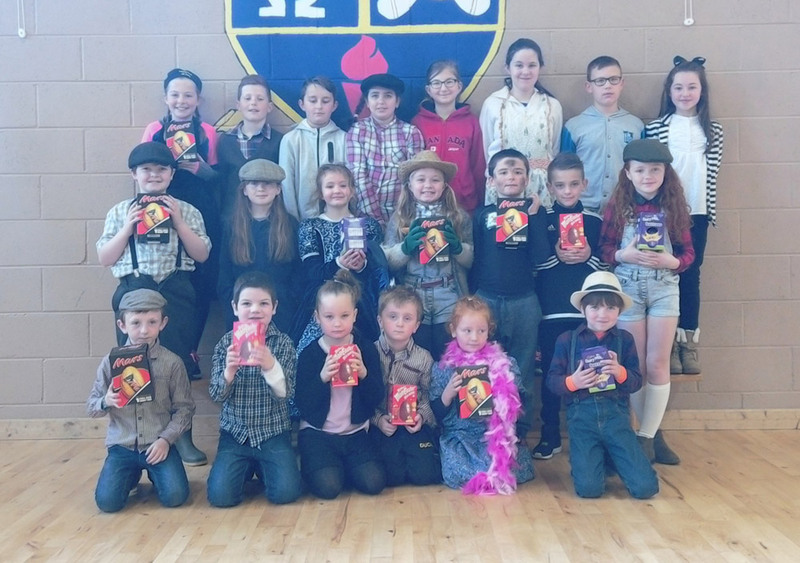 Literacy Week: the school recently celebrated Literacy Week from the 27th February – 3rd March. We hosted a number of events during the week, the highlight being a whole school spelling bee competition. On Thursday, 2nd March we celebrated World Book Day. There are some wonderful podcasts available at worldbookday.com/podcasts featuring unmissable audio excerpts of children’s books for all ages brought to life by a host of brilliant storytellers. Remember to swap your book token for one of this year’s exclusive books from well-known authors such as David Walliams, Julia Donaldson, Enid Blyton, Jacqueline Wilson, Judi Curtis & Francesca Simon. Also if you enter your magical number online each week between 27th Feb – 26th March you could be in with a chance to win some amazing prizes!!! 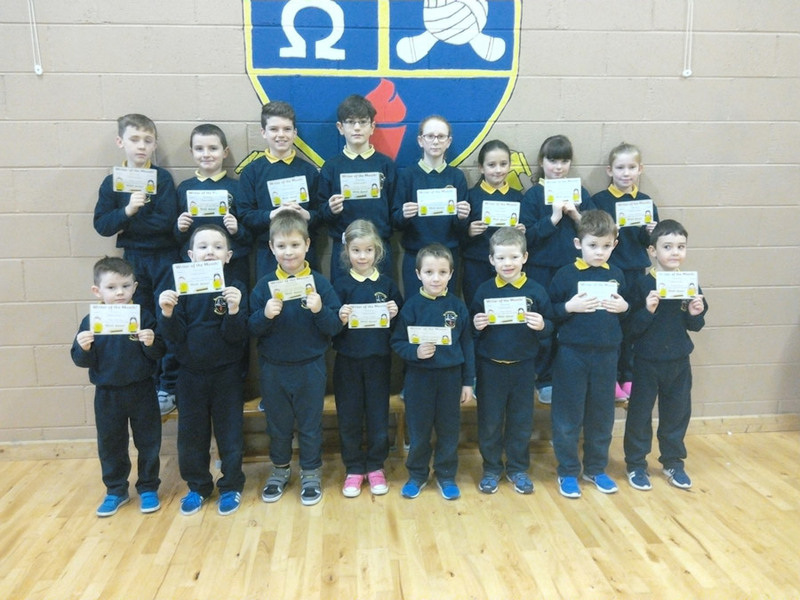 Spelling Bee: Tension was high this week as pupils from Junior Infants – 6th Class battled it out in a Whole-School Spelling Bee Competition!!! In-class knock-out competitions took place all week followed by the big class challenge on Thursday. Well done to everyone who participated in this fun initiative. Congratulations to the overall winners of the competition. Handwriters of the month: well done to all the boys and girls who showed great penmanship throughout the month of February. Active Corville: February was our month of dancing in Corville. The children loved showing off their new moves throughout the month. Last week they were line dancing to Achy Breaky Heart as well as doing some more Irish dancing. For March, we change our focus to skipping. 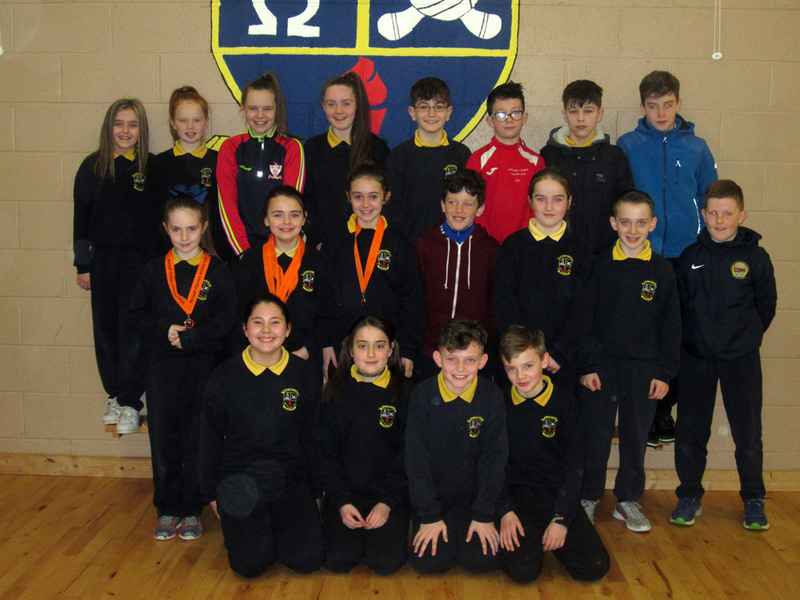 Athletics: we have photos of all our medal winners from the recent North Tipp Indoor Athletics competition up on our Facebook page. Badminton: as part of our Active Corville program we try our best to expose the children to as many different sports as possible. 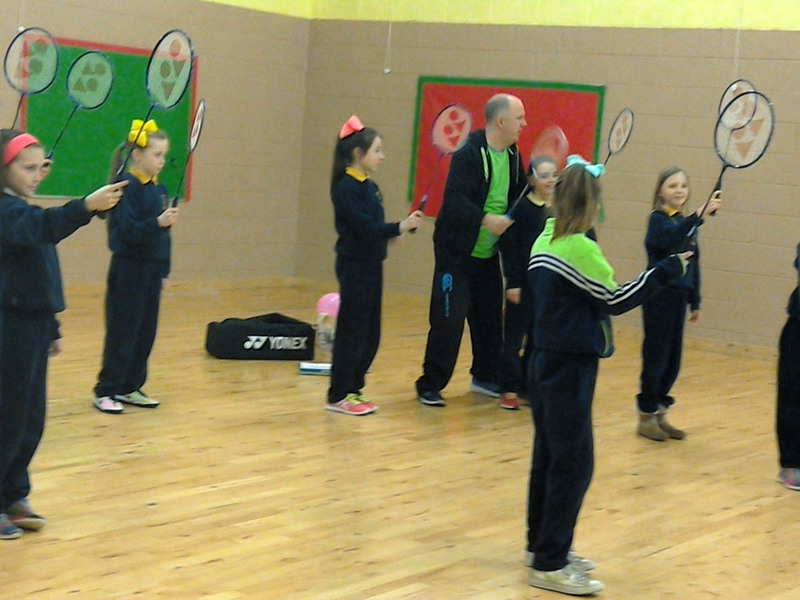 Last week, Mr. Hogan started badminton lessons in the school. The students learned the basic techniques involved in the sport and had fun while doing it. Yard Games: at lunch times our Active Student Committee help out in the junior and senior infant yards. They play various different yard games with the children. My oh my, how time flies! It’s hard to believe that our Montessori here in Corville is already celebrating its 25th anniversary this year. Our Special Time Montessori is a well established Pre-School and After School Care service, led by Ms. Jacqui Maher a graduate of St. Nicholas Montessori College, HDip ECE&C. Our service is a happy, secure, friendly, fun and inclusive space where we all work together to ensure the holistic development of the children. We would like to thank Jacqui for all the hard work she has put into the Montessori over the last 25 years. Everyone that has passed through her doors will testify to the huge effort she has put in to ensure that an early love of learning is instilled into each and every child. 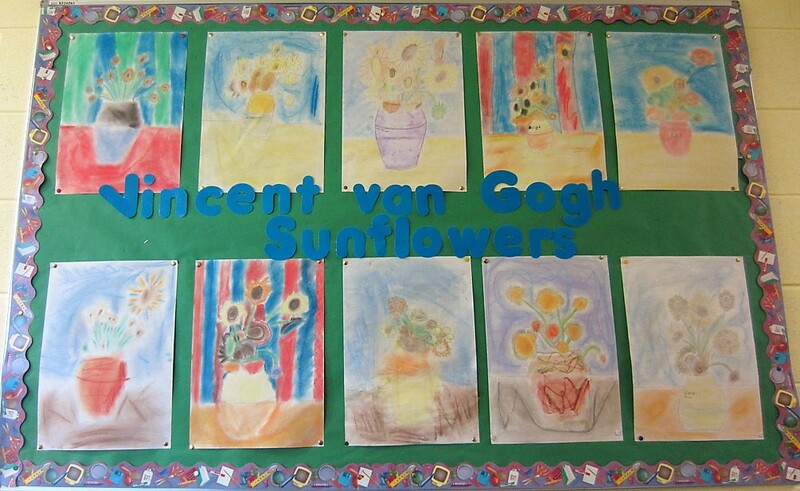 If you are interested in enrolling – check out our new Montessori web page for more details. You can now also keep up to date with all the ‘goings on’ in the Montessori via our new Facebook page. As mentioned in a previous post, the school choir are entering the ‘Walton’s School of Music’ competition in March. The theme is ‘Music has No Borders’. We will be performing the John Lennon Classic ‘Imagine’ and to make things very inclusive we will be singing in multiple langages such as English, Hungarian and Polish. We made a video recording of our choir singing the song and we think they did a fantastic job. Fair play to all the students for working so hard and well done to all the teachers who have put a lot of time into the choir. You can see the choir’s performance in the video below. The song is hosted on our school Active Facebook Page – pop over to that Facebook page while you are at it and give us a like!!! 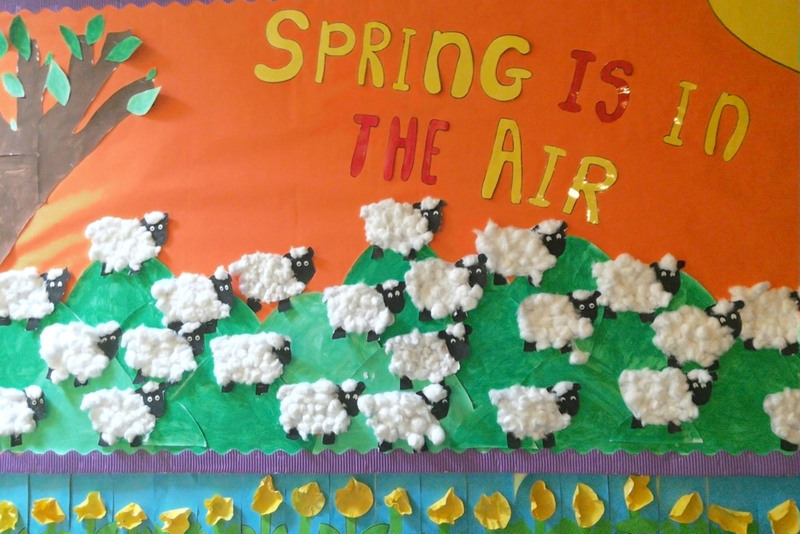 Spring is in the Air: Ms. Mulrooney’s Senior Infants are celebrating the coming of spring with this beautiful display! 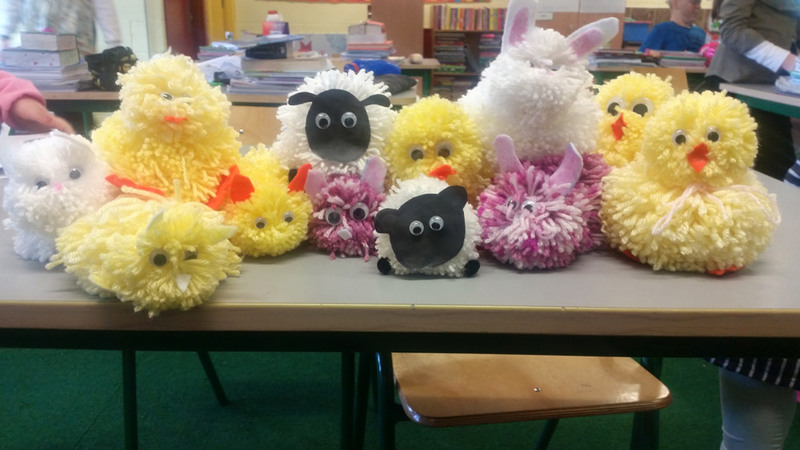 The children did an amazing job creating their daffodils and sheep. We are looking forward to brighter days and warmer weather to come. 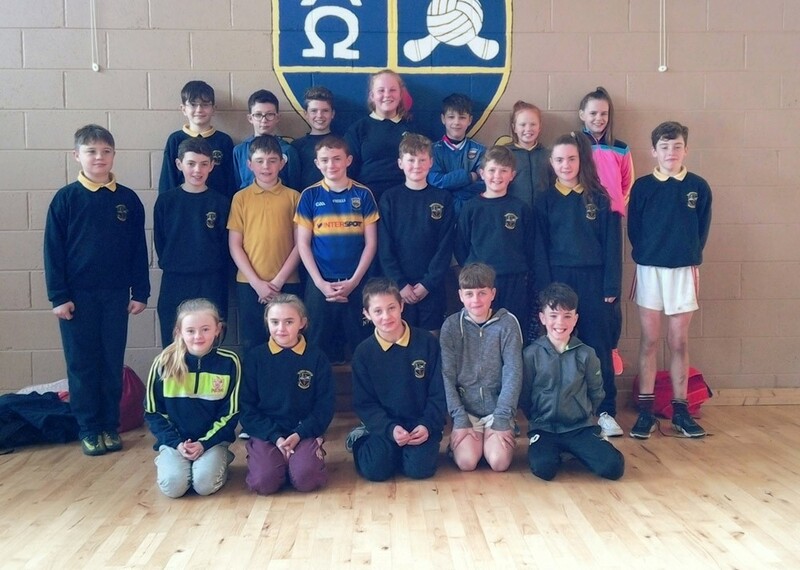 School Athletics: the school recently made the trip over to the indoor track in Nenagh for the North Tipp Indoor Athletics Competition. The school won over 20 medals and we were delighted with all our performances. We will have photos from this event on our facebook page later this week. 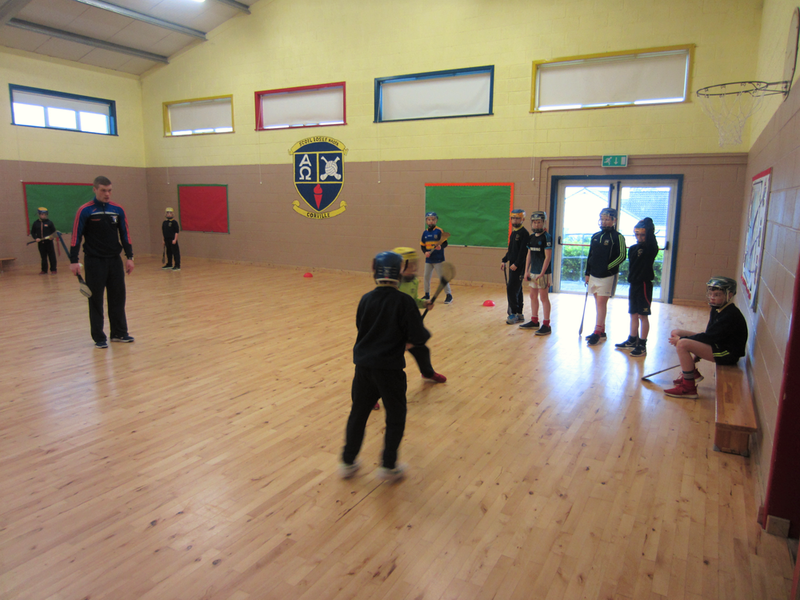 Indoor Hurling Blitz: our 2nd class boys and girls took part in an indoor hurling blitz last week. Mr. Hogan’s team showed lots of courage and skill and were a credit to the school. They won all their matches and thoroughly enjoyed the experience, which is what it is all about at this age group. 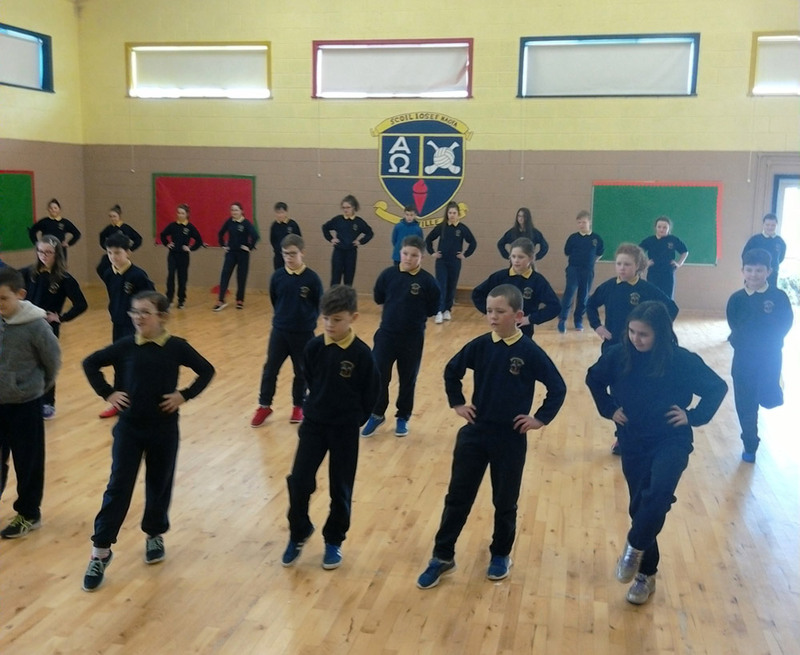 Active Flag: Dancing – the whole school continues to take part in dancing lessons under the watchful eye of our dance instructor Claire Nealon. 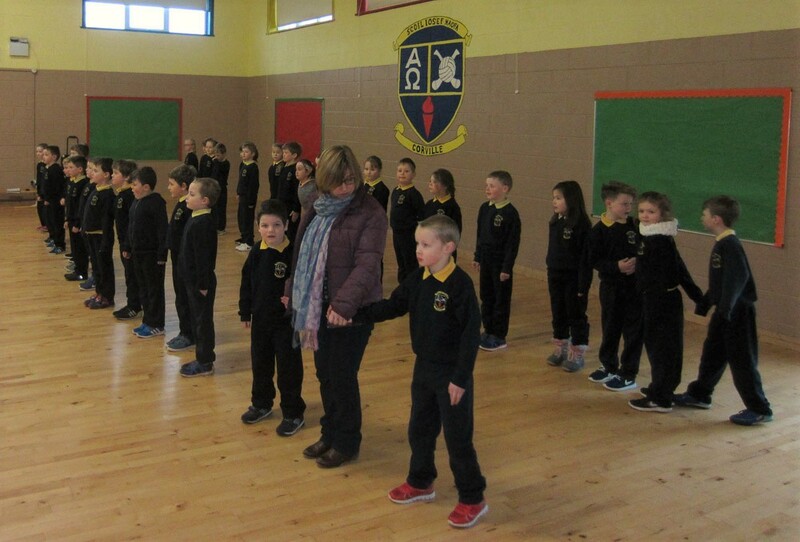 This week the children were learning some new Irish dances. They also took part in a dance off! 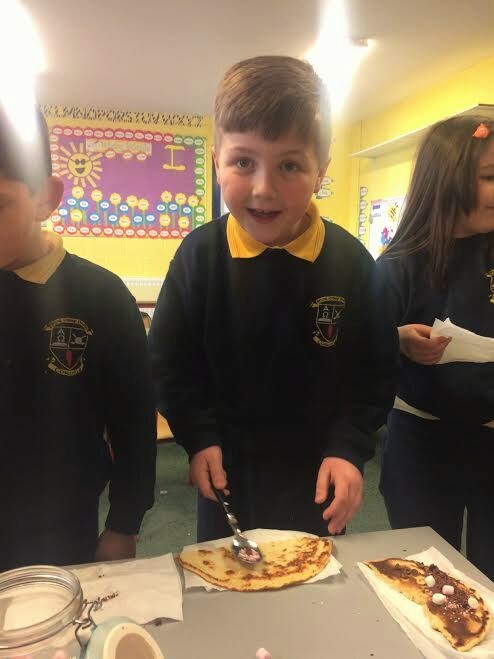 Pancake Tuesday: there was a distinct smell of pancake being cooked all throughout the school on Tuesday. It seems like our students love nothing more than baking and eating pancakes. 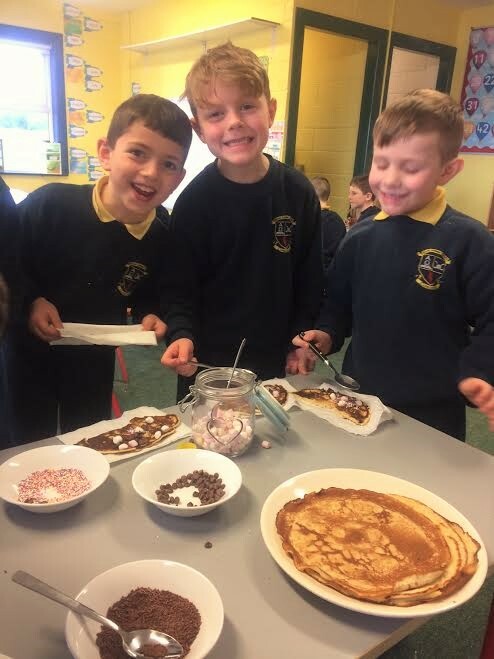 Check out how happy Marko, Jack, Jamie and Jack are with their creations! I wonder if they would be as happy if it was spinach they were eating. School Choir: The choir are entering the ‘Walton’s School of Music’ competition in March. The theme is ‘Music has No Borders’. We will be performing the John Lennon Classic ‘Imagine’ and to make things very inclusive we will be singing in multiple langages such as English, Hungarian and Polish.This is representative of modern Ireland and of the school too. Hopefully we will be one of 12 schools selected for the National Finals in May. 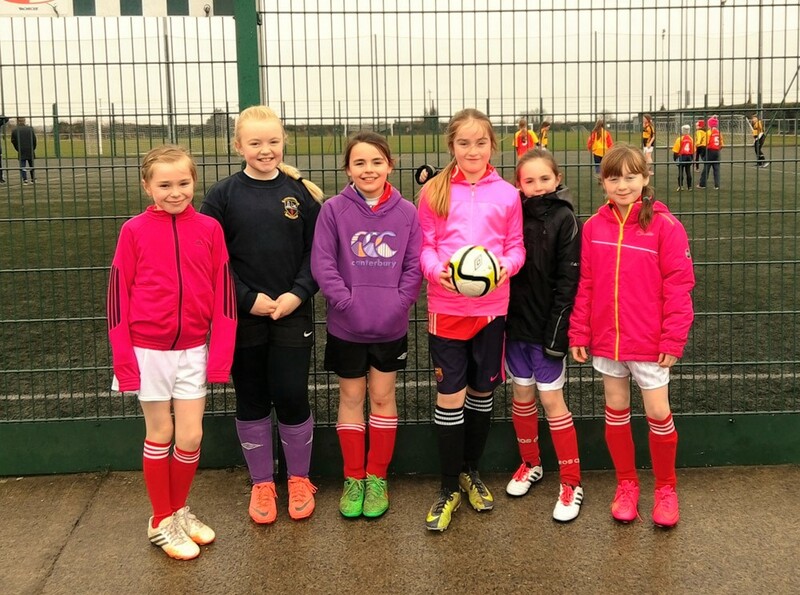 FAI 5 a-side Futsal Tournament – 3rd / 4th Class: our girls were in action on Tuesday at this re-arranged soccer tournament in Thurles. The tournament was due to take place before Christmas but poor weather led to its cancelation. The weather wasn’t much better on Tuesday but thankfully conditions improved as the morning progressed and the tournament went ahead. The girls found themselves in a group of 4 and were up against Ballylooby, Cloughjordan and Burncourt. This was their first soccer tournament so it was hard to know how our girls would go. In the end, the girls won all their matches easily and showed a lot of class on the pitch. They behaved themselves very well and were a credit to the school. It was great for them to get some experience of a tournament at this age group. The experience will stand to them as they get older. No doubt, some of this team will also be part of the U/13 team that will play in the Spar FAI tournament in April, which will take place on the same grounds in Peake Villa. Hopes are high that we can do very well in that tournament too. 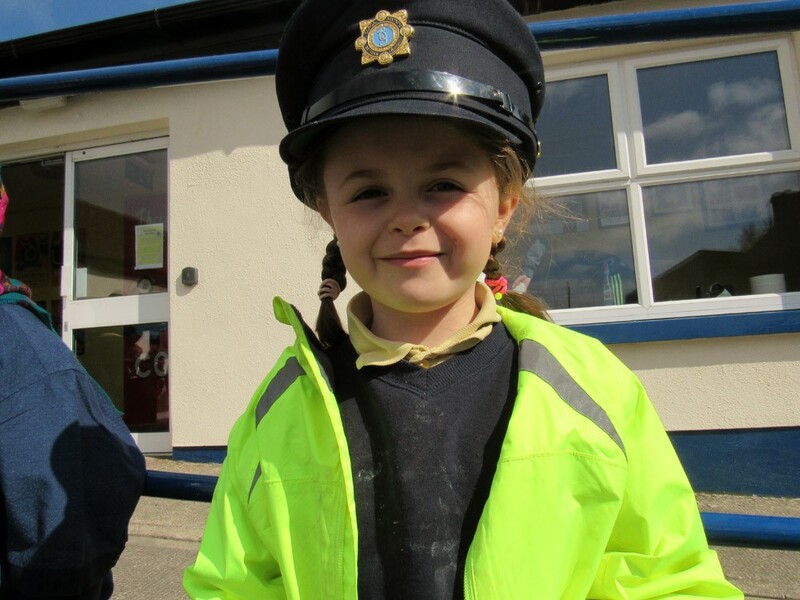 Well done again to, Captain Ceola and her team – Niamh, Madison, Kelly, Teegan and Jessica. Active Facebook Page: you can check out more photos from the soccer tournament on our Active Facebook page. We try to update this Facebook page regularly with all things ‘Active’ in Corville. Make sure to visit and like this page to stay updated. Handwriters of the Month: well done to all the boys and girls who showed great penmanship throughout the month of January. Erasmus: Corville are very lucky to be taking part in the Erasmus+ project this year. 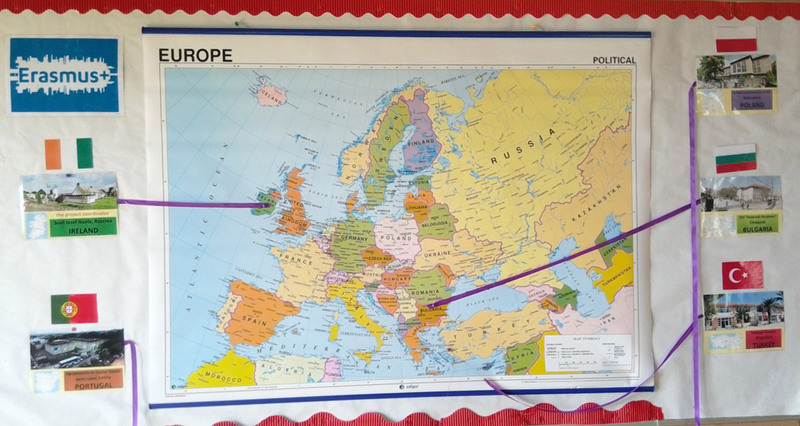 We are the coordinating school in Ireland and are linked with four other schools around Europe. As part of the programme we will be travelling to each of the four countries; Poland, Turkey, Bulgaria and Portugal. So far we have visited one school in Poland. 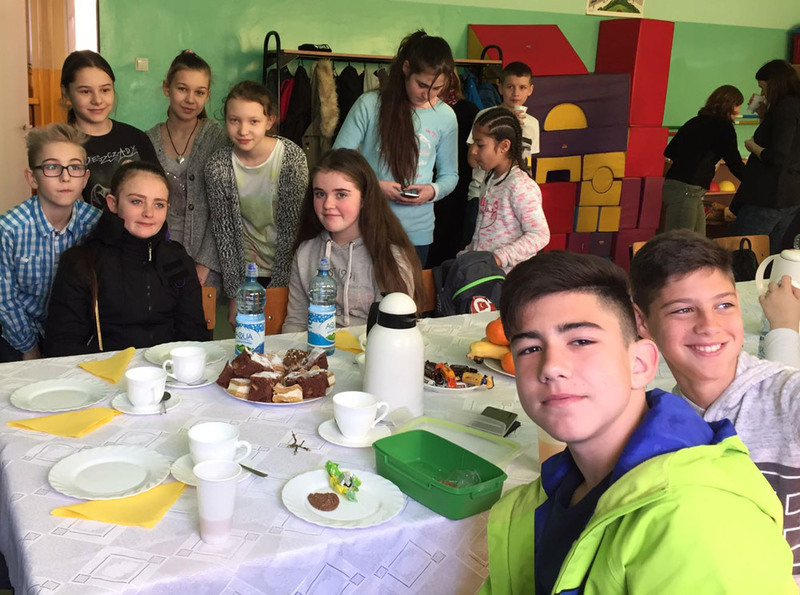 This week Ms. O’Connell and Ms. Shanahan have travelled over to a school in snow covered Bulgaria. They will meet be meeting with the students and teachers over there and they will make a presentation about industry in Ireland. Next on the calendar, we will be welcoming schools from all over Europe to Corville! 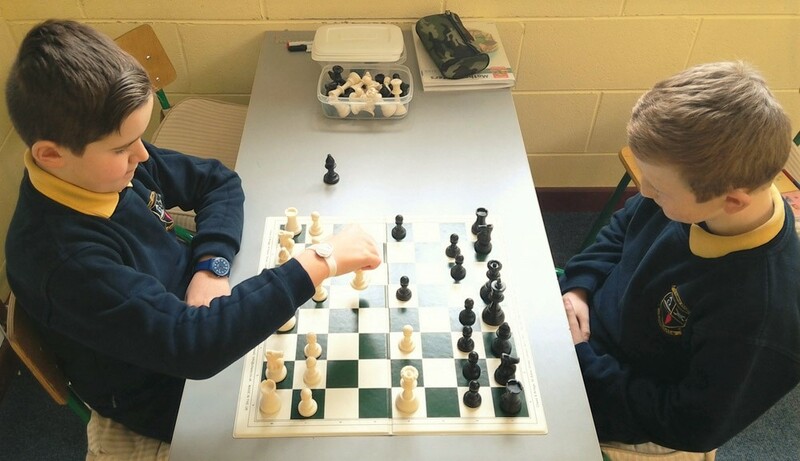 Chess Team: the school are training some of our children how to play chess. This is a game of strategy which is great for improving concentration, forward planning and problem solving. It also helps to instil a sense of intellectual success by allowing our bright youngsters to use their intelligence in an exciting and rewarding way. Their coach, Mr. Scully, is hoping for the school to enter a team of 5 into a future community games competition. It will require lots of practice to get up to that standard, but if anyone can, Corville can! As you can see in the videos below the kids had a great time doing this. Having fun while we get fit is very important. This was a great way to start off our Friday morning in school! 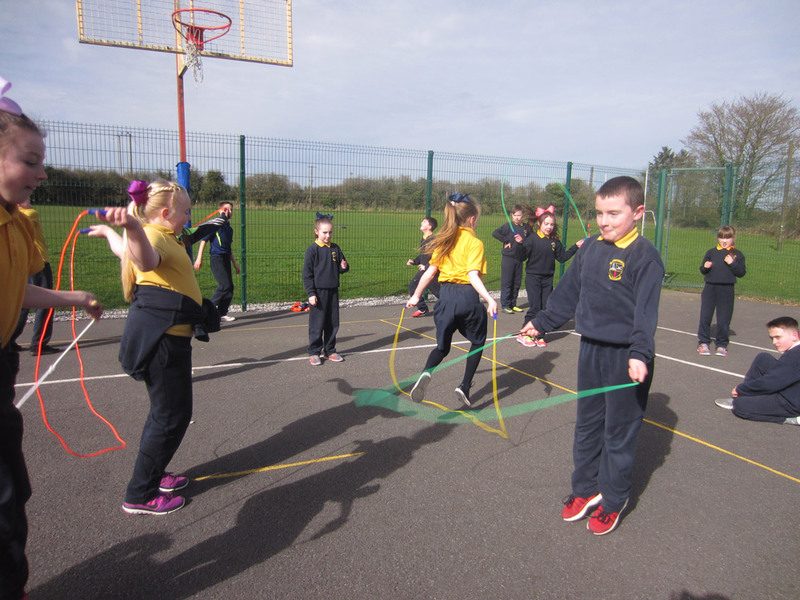 Active Flag – School Survey: As part of our Active Flag itinerary we decided to conduct a survey in school. The survey question was ‘What sports teams do you play for outside of school?’. 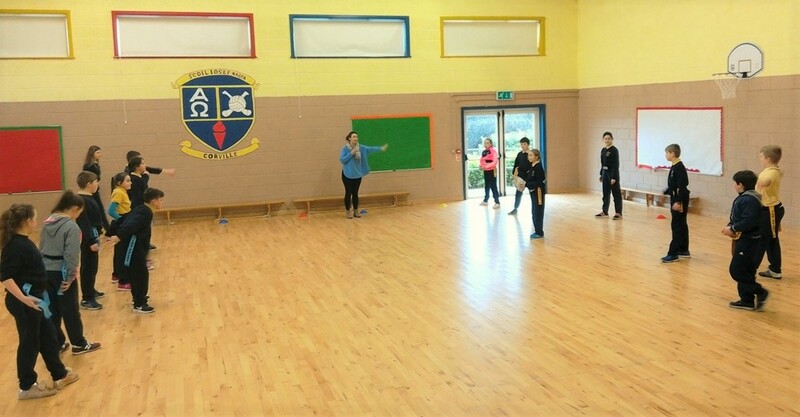 At Corville, we are always pushing our students to join some of the many teams in Roscrea and surrounding area. This survey would allow us to see if our students are active outside of school too. 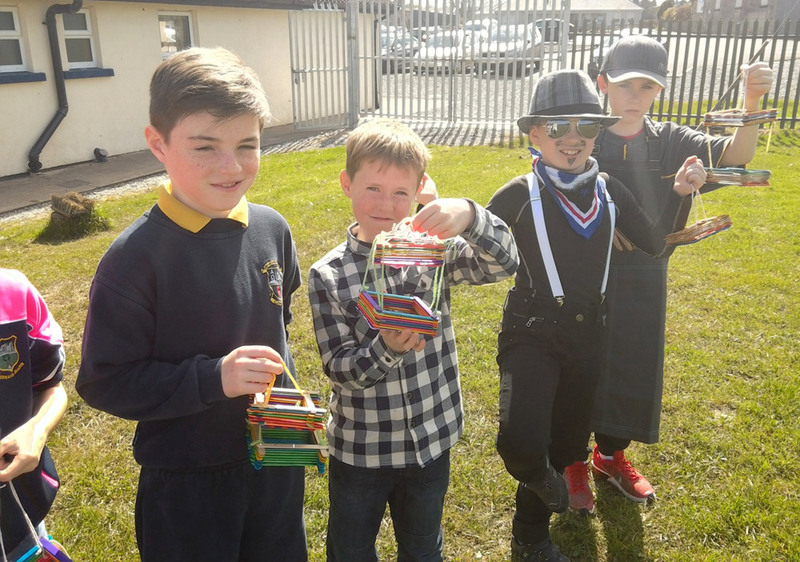 The survey was carried out by the 6th class members of our Active School Committee – Khya Lynch, Mollie Dooley, Ryan Feehan Moloney and Devin Loughnane. They did a fine job and you can see the results of that survey below. It makes for interesting viewing. 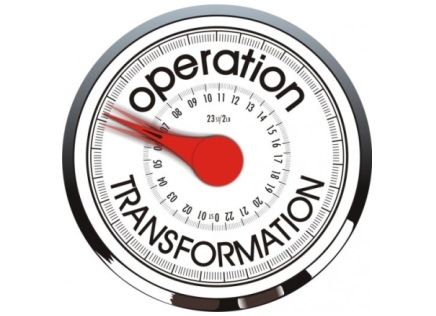 It’s all systems go here in school as we are busy getting fit and active. The months are flying by and our students are being exposed to a wide variety of activities. Below you can see the Active Calendar for the 2016 / 2017 year. As you can see we have plenty of interesting things to do. 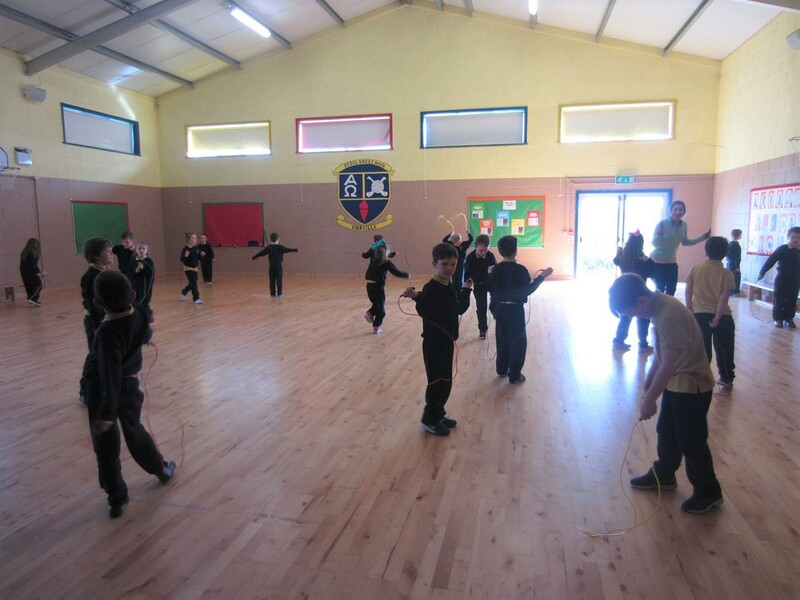 Right now we are focusing on dance and the following month we will all be getting our skipping ropes out. 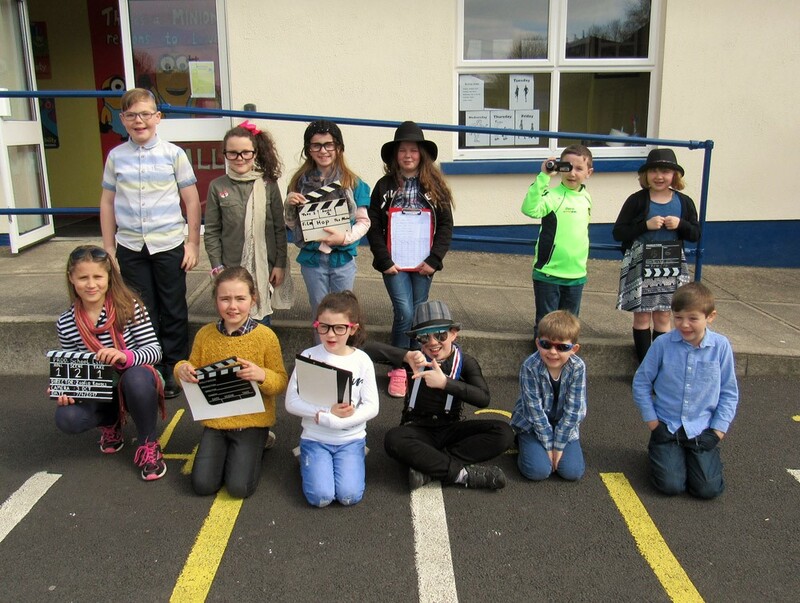 The school recently applied to be featured on this popular RTE show. The show were looking for schools to take part in a 10@10 project. We haven’t been selected for this one but nevertheless we are going to go ahead with our 10@10 tomorrow anyway. Our plan is to have an outdoor bootcamp in our school yard for 10 minutes at 10 o’clock. 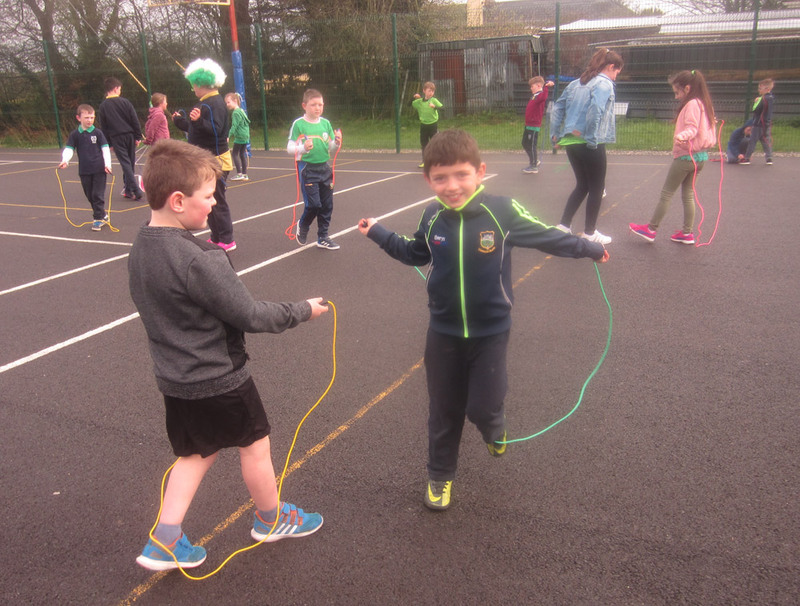 Ms. O’Connell will be the instructor and I am sure the whole school is looking forward to getting out into the fresh air for some fitness work. We will have photos and a video of the event up on this website sometime next week. For Active Flag this month our school are learning how to dance! 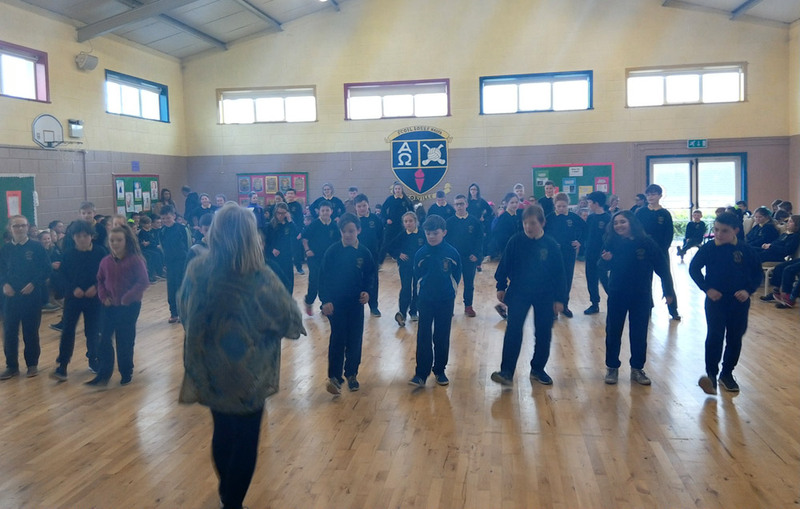 Our dance instructor Claire Nealon came to our school and taught all of the students how to do the Waltz and how to Line Dance. Afterwards they got to do some freestyle dancing! Everyone is having great fun learning how to dance along to the music and are excited to dance again next week. It is great to learn new things like this. Also in February, the school are running a bootcamp for parents. It is great to see parents leading by example. We encourage all parents to come and give it a go if you have the time. It is on Friday mornings from 10:30 to 11:30 in the school hall. In February, we welcomed three external coaches into Corville. We love seeing the wider Corville community getting involved with the school. Tadhg O’Connor is no stranger to the school as he has been helping out with hurling in the school for a long time. 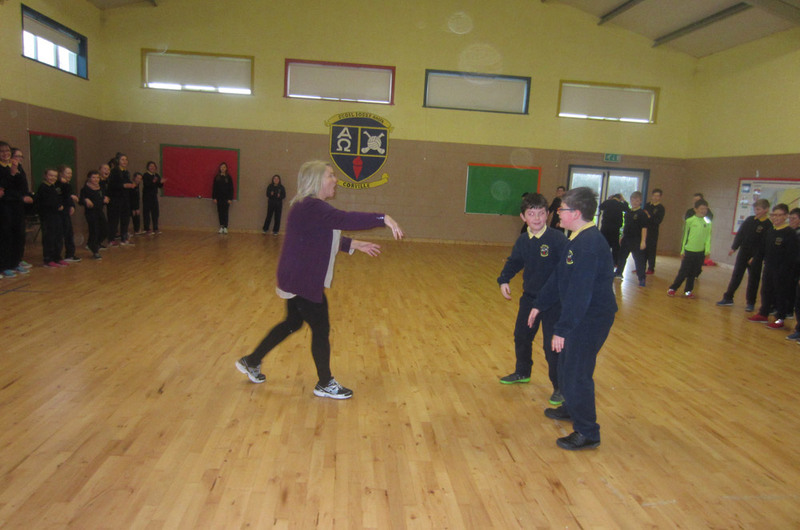 We also welcomed our dance teacher Claire Nealon and our rugby coach. They are doing a great job with the kids. 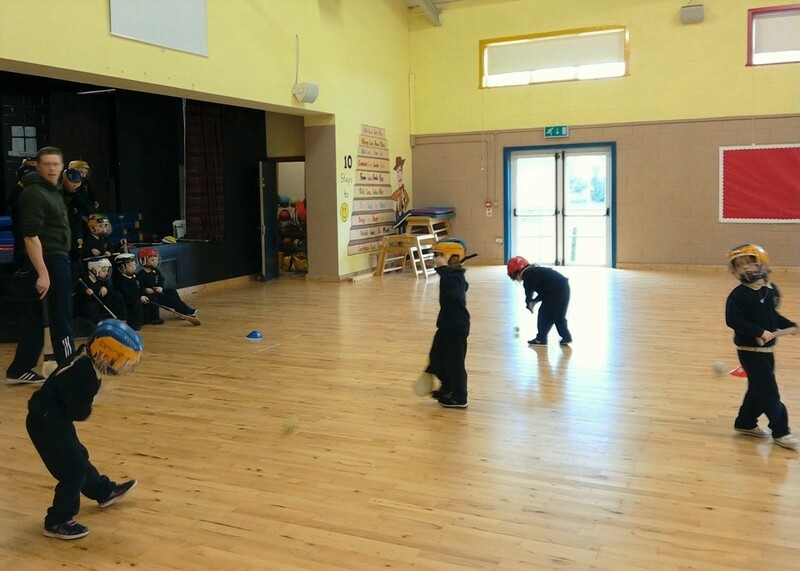 Even our junior infants are learning the skills of hurling – you can never start them too young!! started a new ‘Do Your Talking as You are Walking’ campaign. Instead of standing up and talking to your friends – we now encourage the children to walk and talk! Yard Games – our student committee are helping out in the yard with various games. In the photos you can see our junior infant classes enjoying the games. 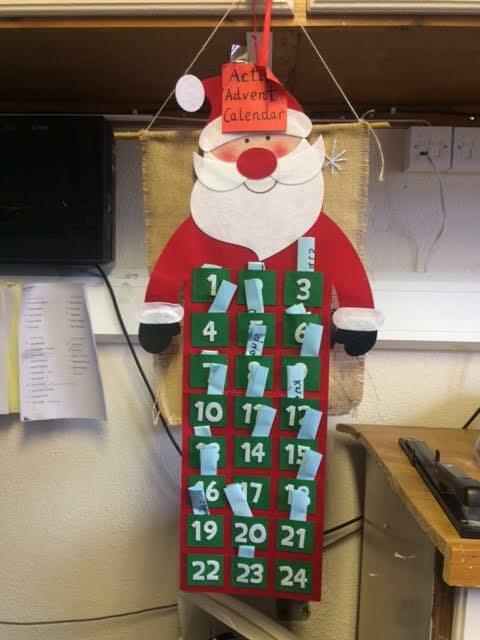 Before Christmas, the school ran an Active Advent Calendar campaign where each day we opened a panel on an advent calendar that revealed a new exercise that everyone in the school had to do at 11:30 each day. We all had great fun doing this and looked forward to hearing the instructions coming out over the intercom each day. We also started doing Active Homework in November for the first time. We are hoping to send the message that staying fit and active is not just something you do in school. You need to get a good hour of fitness work in each day to keep fit so staying active at home is important. 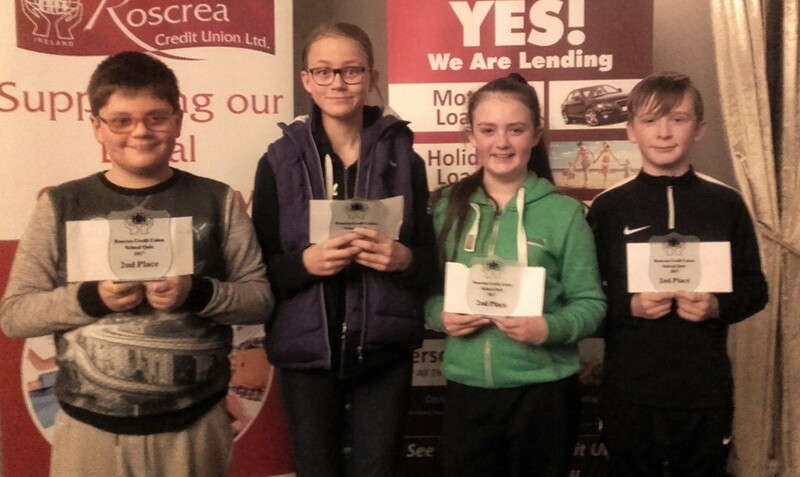 Credit Union Quiz Success: our U/11 and U/13 quiz teams were both in action at the local heats of the Credit Union Quiz competition. This year the team felt they had a shot at winning the quiz so hopes were high. In the end, our U/11s finished in 3rd place and our under 13s finished in 2nd place. Although they didn’t win and qualify for the regional finals, both teams are still very happy with their super results! They worked very hard to prepare for this quiz with their teacher Mr. Scully. The school are extremely proud of the effort each member of the teams put in. Karlo Pohjanen was appearing on the school quiz team for the first time and he had this to say “I am very happy with our final score. It was very hard for everyone but we tried our best and it was great to finish 3rd. We hope we can do even better next year!”. 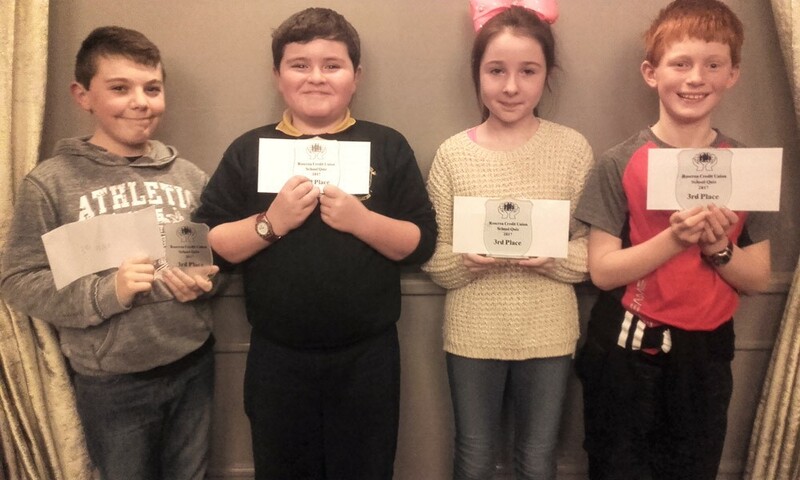 U/11 Team: Senan Whelan, Ryan Whelan, Karlo Pohjanen, Sheena Wright. U/13 Team: Keri Pohjanen, Ross Walsh Shovelar, Shauna Egan, Ryan Feehan Moloney. Learning Braille in Corville: Braille is a way for blind people to read text. 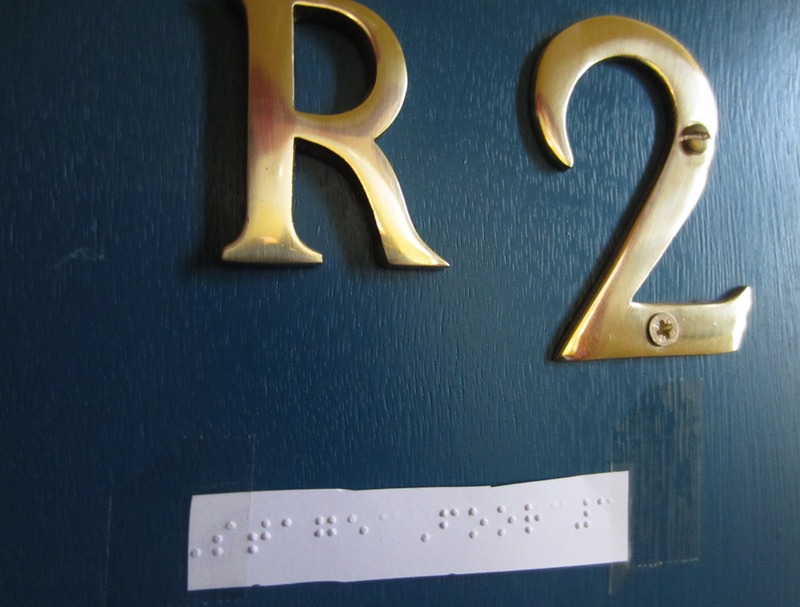 Around the school, examples of Braille can be seen on each of the classroom doors. Ross Walsh Shovelar is currently learning how to use Braille, and is showing all the students how to use it. The children of Corville love learning new things and Braille is a very interesting topic. You can can see an example of the braille on one of the doors below. Sport in Corville: it’s all systems go on the sporting front in Corville. 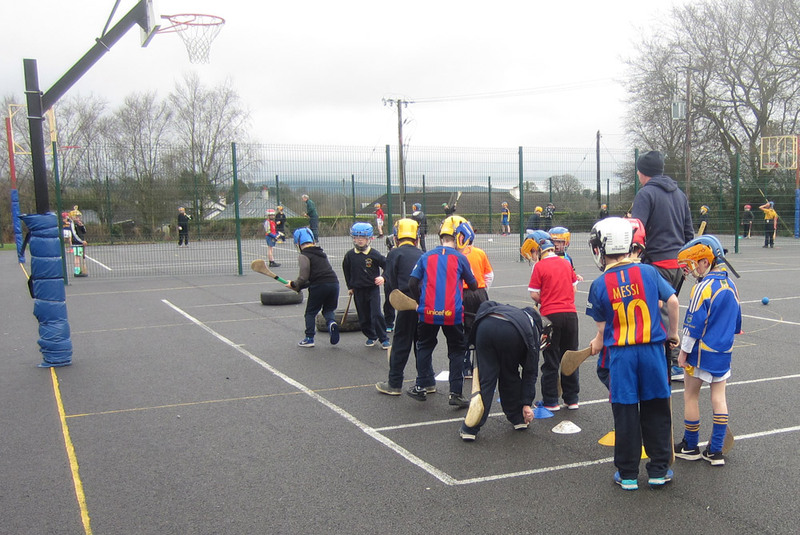 Our hurling and camogie teams have begun training and are making great progress. 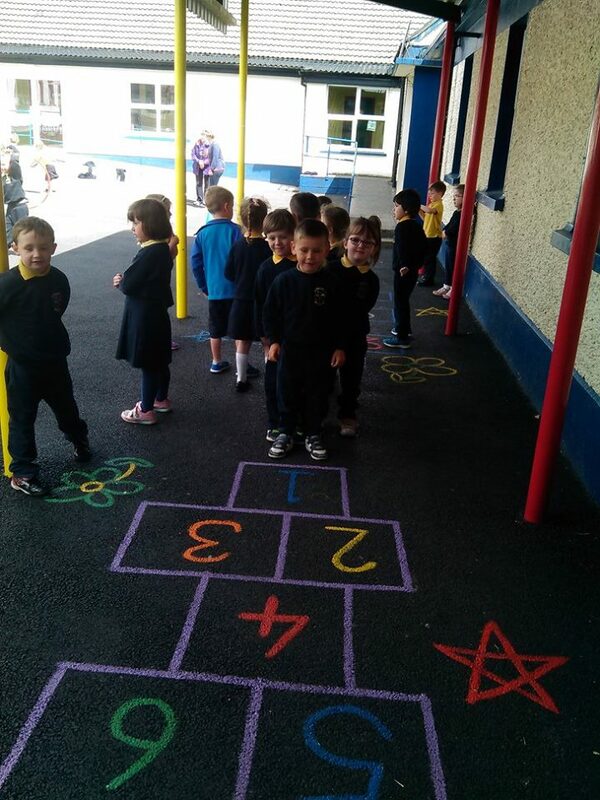 Even our junior infants are getting in on the act (see photo below)! Tag rugby is already taking place each week and soccer is starting next week for girls and boys. Indoor athletics is the next big competition for the school. That takes place in just a few short weeks so the field will be full of puffing and panting kids for the next while! 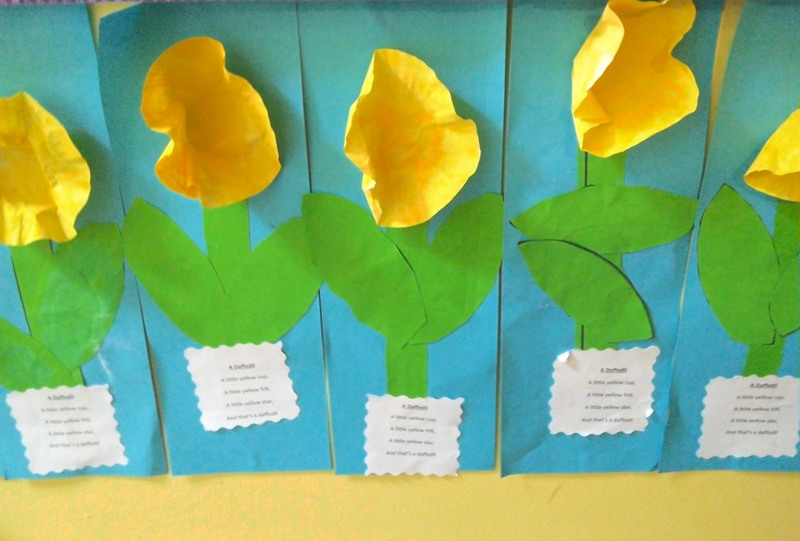 Classroom Updates: check out how the children in each class are doing on our classroom pages. Visit our Infant Classes, Middle Classes or Senior Classes. Below is a small example of what students have been getting up to. Parents: why not sign up for the following classes in the school? Photography class: Damien Carroll is now teaching a digital photo class for adults in the computer room in Corville. This will take place on Monday evenings from 7pm to 8pm. The cost is €10 for a 6 week course or €2 pay as you go. Cookery: Dolores Flynn is teaching adult cookery classes in the school. This class takes place on Tuesdays from 8pm to 9pm. The cost is €10 for a 6 week course or €2 pay as you go. 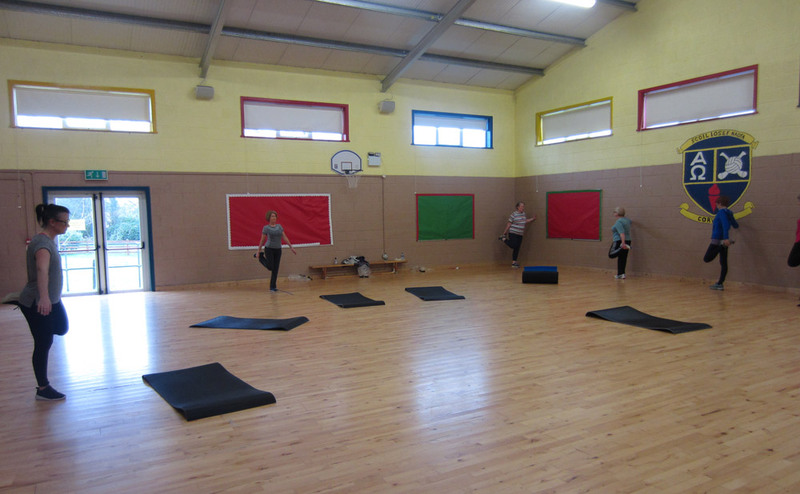 Bootcamp: for parents is back up and running after the Christmas break with Emmet Quinlan. Emmet is a qualified strength and conditioning coach and personal trainer. The class is open to all parents and friends of Corville. It is on Friday mornings from 10:30 to 11:30. We hope everyone enjoyed the Christmas break and we wish everyone a happy New Year. 2017 is here and we are expecting a big year ahead for the school. There is no rest for the wicked so as usual the school is very busy with various extra-curricular activities starting up again. Hurling & Camogie: now that the primary football season has come and gone, it is now time to focus on the hurling and camogie. We hope to replicate the amazing success we had with the big ball last semester with the small ball. 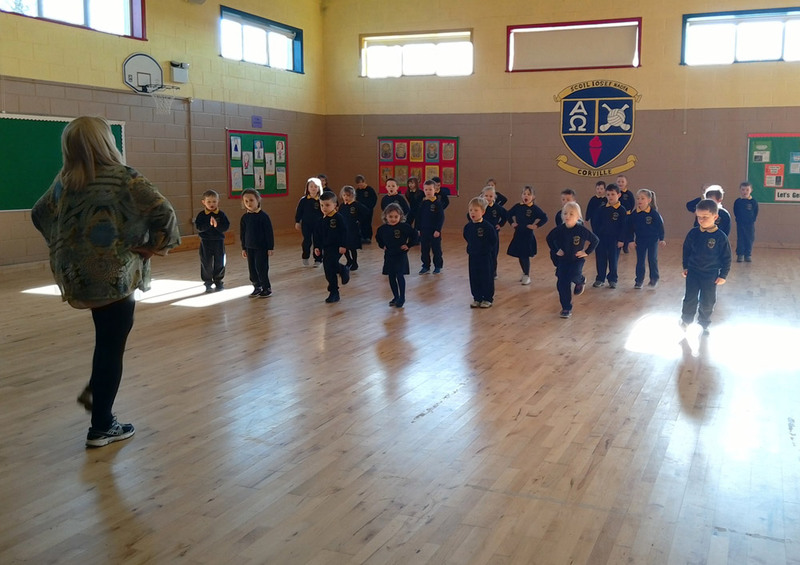 Tadhg and Mr. Hogan are putting our middle classes through their paces each week and our after-school training is about to start up for senior classes very soon. We hope to see plenty of students out training with us each week. We are going to need a big team effort if we are to have a successful year. 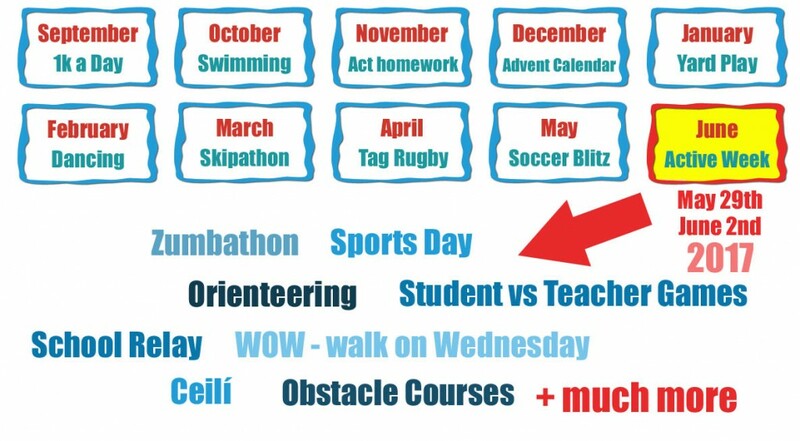 Tag Rugby, Soccer, Athletics: these are very popular school sports. Tag rugby has started at lunch times for 5th class. Soccer for boys and girls will be starting in two weeks time. The athletics team will be resuming training shortly too. The indoor athletics competition will be taking place soon so anyone who is interested in taking part should make themselves available at training when it starts up. 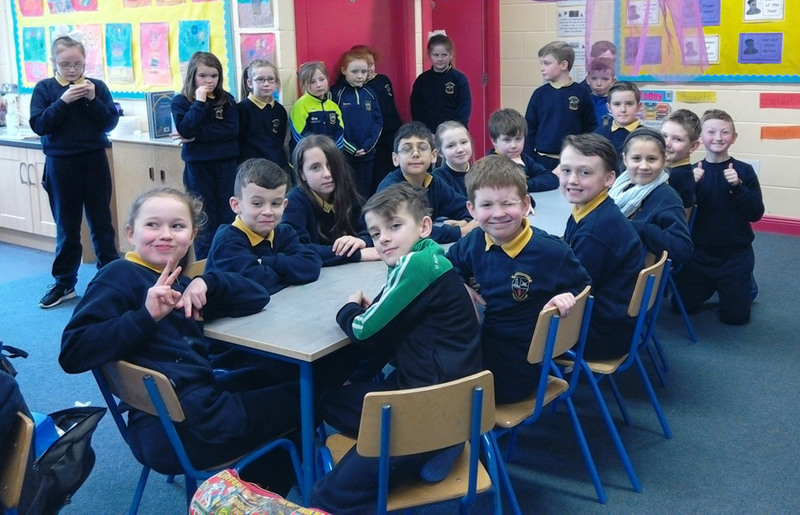 German classes: a new school initiative started up this week offering the students in 5th and 6th class the oppotunity to learn German after-school. 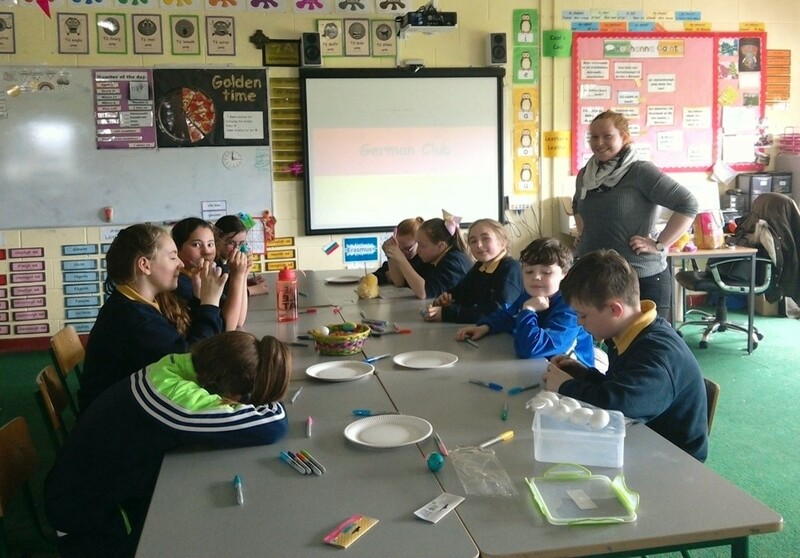 This german course is being taught by Ms. Ryan and it gives the children a great chance to get a head start on foreign language learning before they leave for secondary school. The course is proving to be very popular so far, so danke schön Ms. Ryan for all your fine work! Green Flags and Active Flag: work will continue on gaining our blue Active flag this semester. Expect lots of school-wide activities to get everyone up and moving. We will also be working on maintaining our 5 green flags. Our green flag committee will have a busy few months ahead of them. Spelling Bee: the school will be running a knock out competition to choose a student to represent the school in this year’s nationwide spelling bee competition. If you are good at spellings then make sure to enter this competition. It is open to all 5th and 6th class students. Well done to those that made the team but we would also like to thank the great effort put in by others who weren’t so lucky. In last year’s competition, both of our teams came 2nd in the local heats. Unfortunately only the winners progress to the next round. This year we hope both teams can go one step further and make the next round. 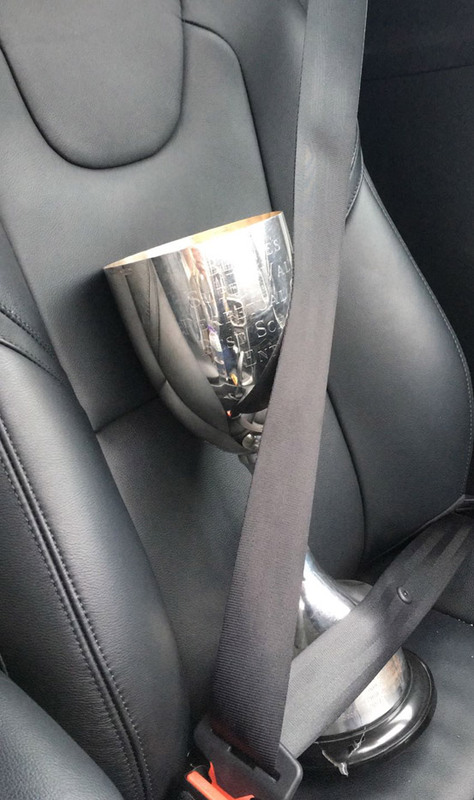 There are 3 rounds in total – local, regional and All Ireland. Our teams will be working hard for the next two weeks to prepare as best they can for the quiz which takes place in the Racket Hall on Monday, Jan 30th. Welcome to Corville! 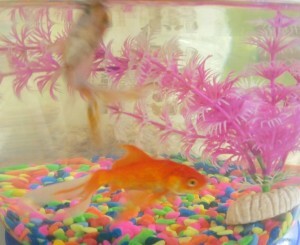 The students in Mr. Stapleton’s 2nd class were delighted to welcome two new additions to their classroom. 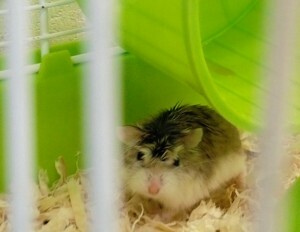 Harry the Hamster plus the goldfish Zig and Zag will need to be looked after for the rest of the school year. We are sure the 2nd class children will take great care of them for the rest of the school year. Judging by the excitement in the classroom there will be no lack of volunteers when it comes to feeding time!